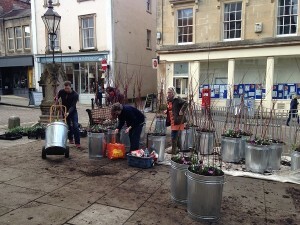 we thank everybody who has got involved, please do get involved! 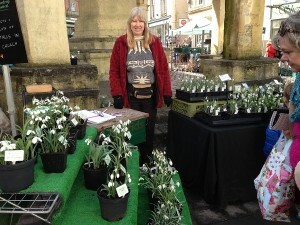 Shepton Mallet is the first place in the world where new Snowdrop varieties were bred. James Allen was the first person ever to breed new varieties from wild snowdrops – pioneering work he carried out in his home town of Shepton Mallet. 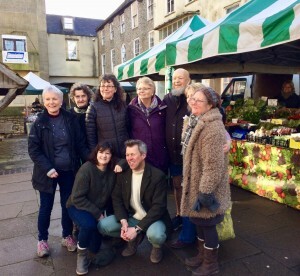 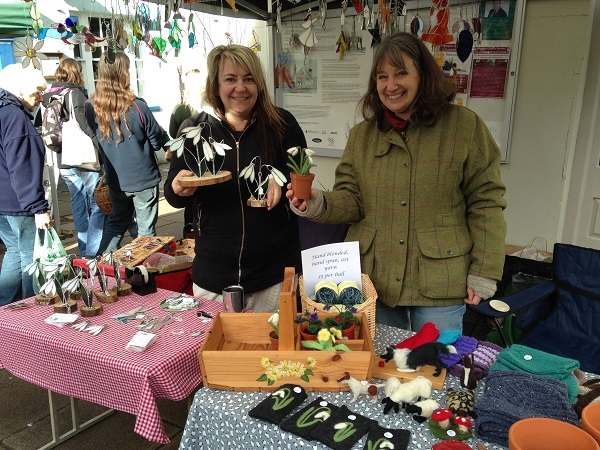 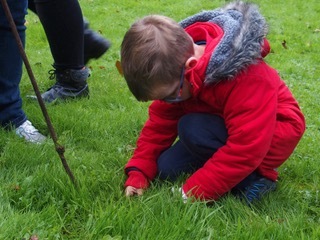 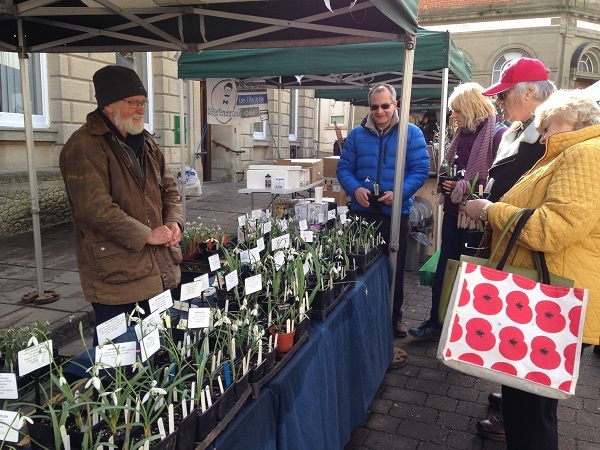 The Snowdrop Festival is a vibrant community project to plant Shepton Mallet with thousands of snowdrops and celebrate its place in gardening history. 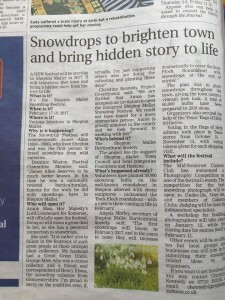 In the late 19th century breeding snowdrops became highly fashionable and one of Britain’s top snowdrop hybridisers lived in the Mendip town. James Allen grew all the species and varieties then known and was probably the first person to deliberately cross them and raise hybrids from seed. 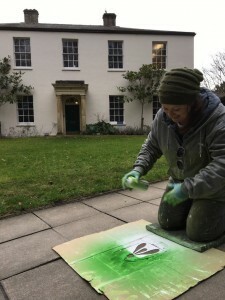 He undertook this work at his home here in the heart of Somerset at Highfield House, now part of the Mendip District Council site. 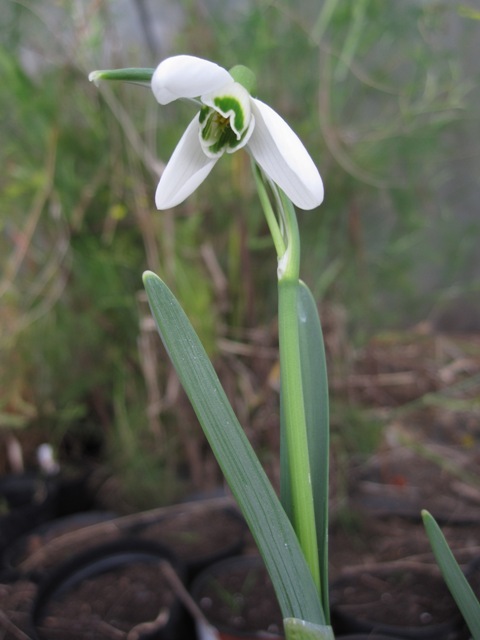 It’s thought there were more than 500 cultivars of these dainty ‘milk flowers’ as the snowdrop’s scientific name Galanthus translates, and Allen is credited with breeding at least 100. 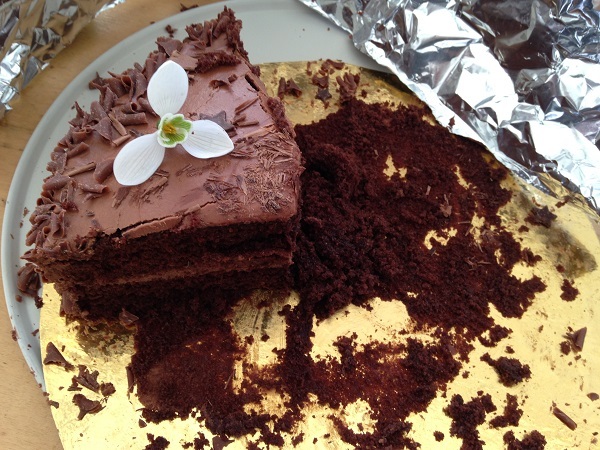 Sadly his astonishing work was blighted when a fungal infection of Botrytis followed by an attack of narcissus fly destroyed much of his collection. However, all was not lost – two of the varieties he bred here in Shepton Mallet still survive to this day; ‘Merlin’ and ‘Magnet’. 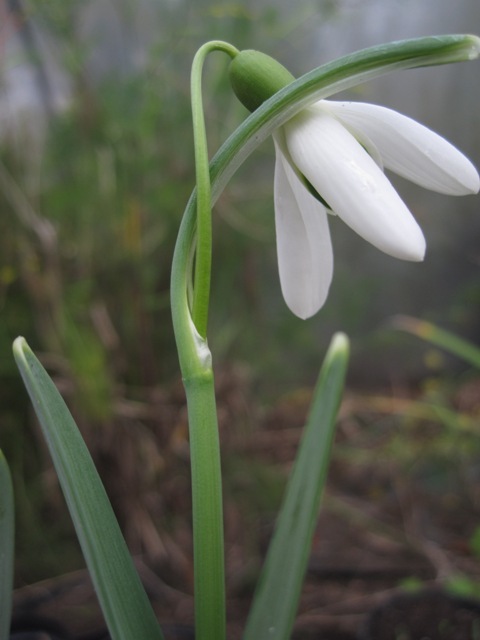 Merlin’s inner flower segments are completely green, and Magnet has an unusually long stalk, so its flowers wave in the slightest breeze. 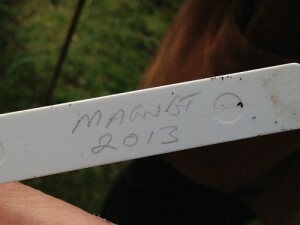 Magnet is considered to be so beautiful that the Royal Horticultural Society has given it the Award of Garden Merit. Shepton Mallet Horticultural Society is keen to rekindle James Allen’s enthusiasm and passion for snowdrops in the town, and has adopted the flower as its emblem. 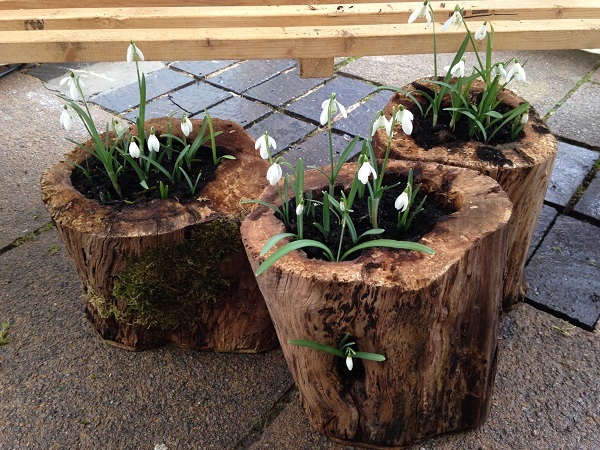 We are now encouraging the planting of Magnet and Merlin, as well as a whole host of other snowdrops, in gardens, schools, parks and other public places in and around the town. October is the time for planting snowdrop bulbs, here we are planting 10 per pot for new stock to go into the planters for the High Street. 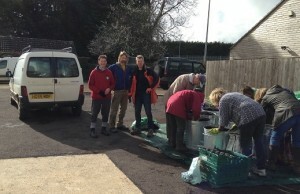 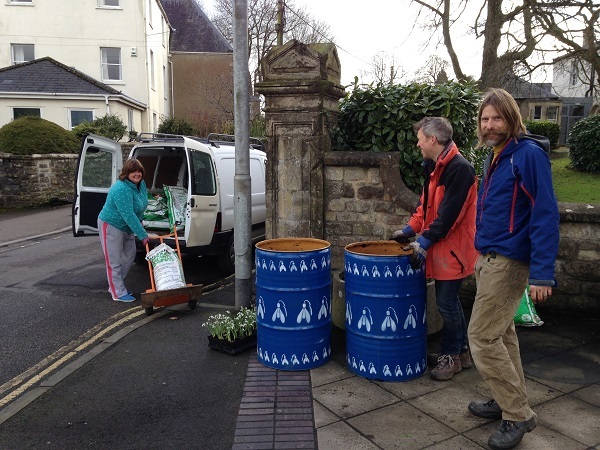 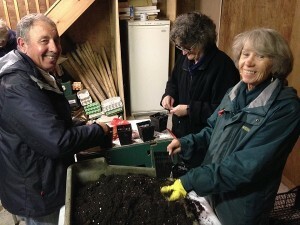 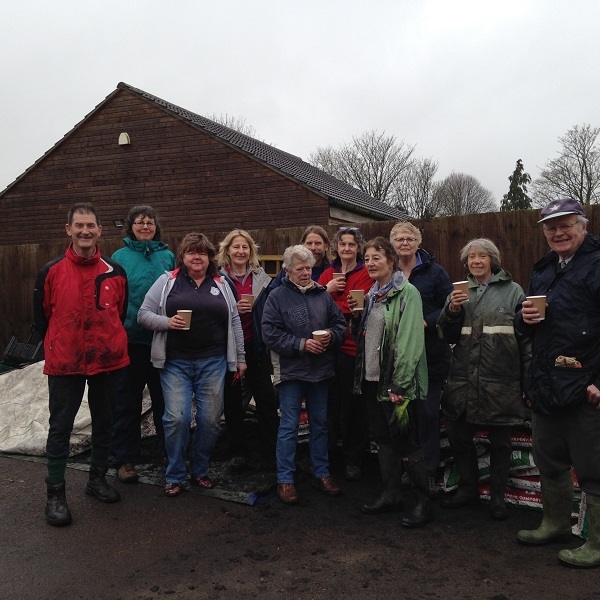 The compost was donated by Castle Gardens garden centre in Sherborne. 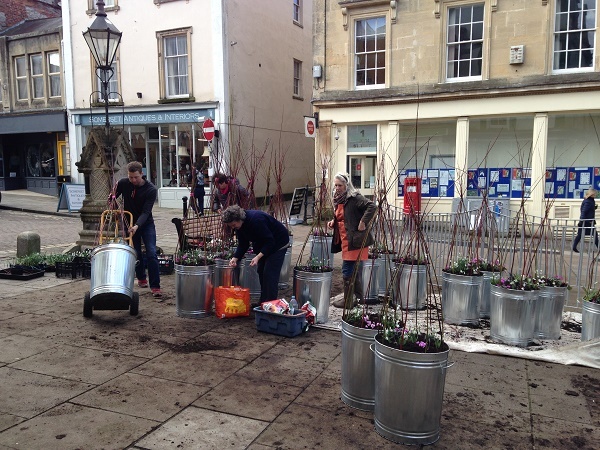 This autumn we have planted another 28000 snowdrops in Shepton Mallet town centre in preparation for Snowdrop Festival 2019. 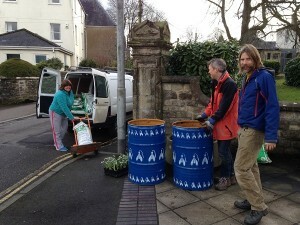 Five of our members participated in the Shepton Mallet carnival bucket collection last November. With wheel barrows and buckets our team wore fancy dress inspired by Bill, Ben and Weed. 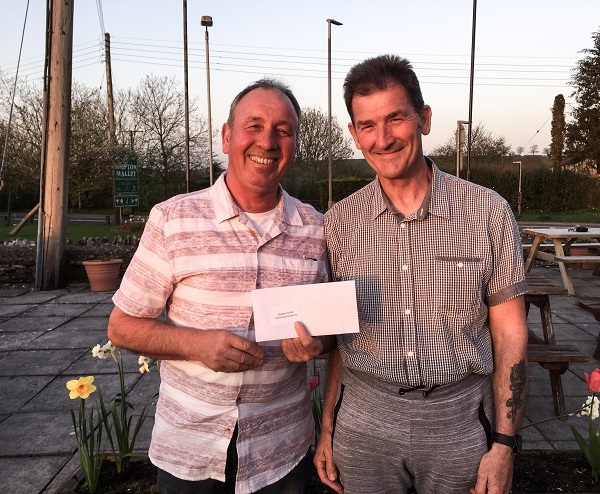 On 20th April Shepton Mallet Carnival club presented Ray and Royston with a cheque for £200 to go towards the Shepton Mallet Snowdrop Festival. 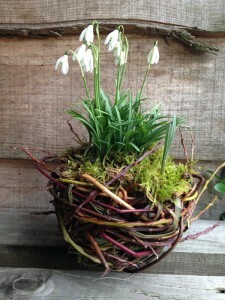 We left the snowdrop planters out for 3 weeks this year, several days of which they were buried under snow. 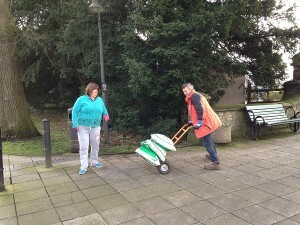 This is a heavy job so strong help will always welcome in the future. 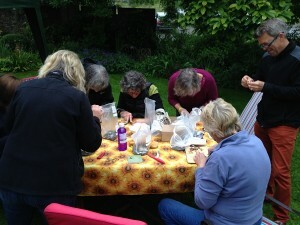 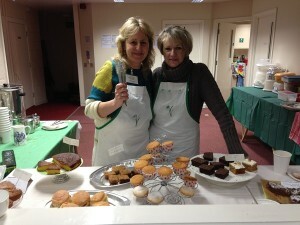 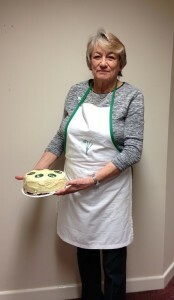 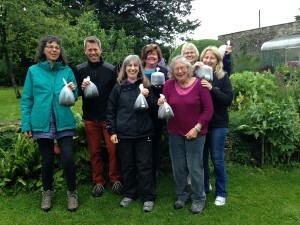 Our team endured light rain for this task and were rewarded by coffee and home made brownies made by Zena. 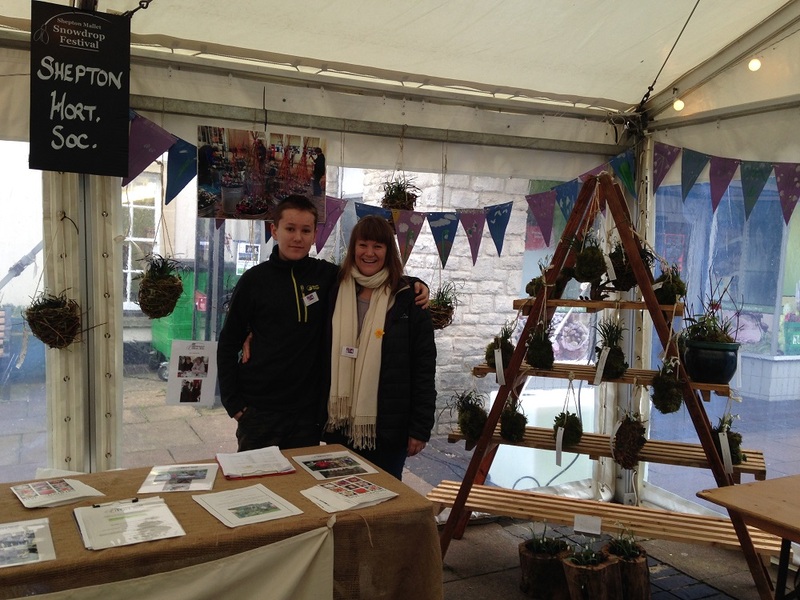 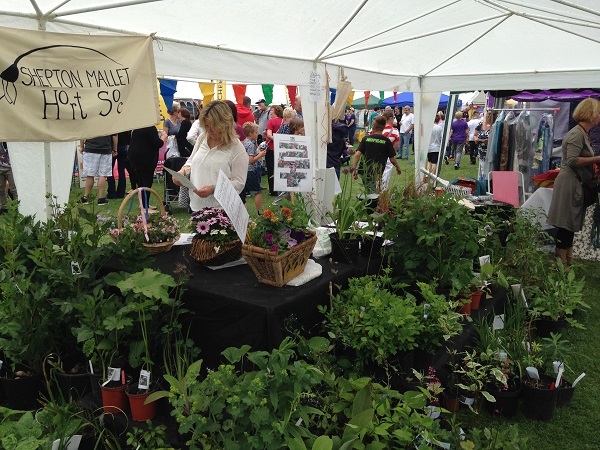 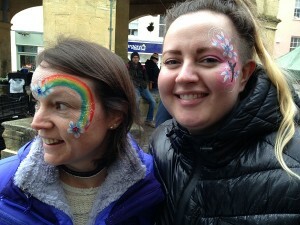 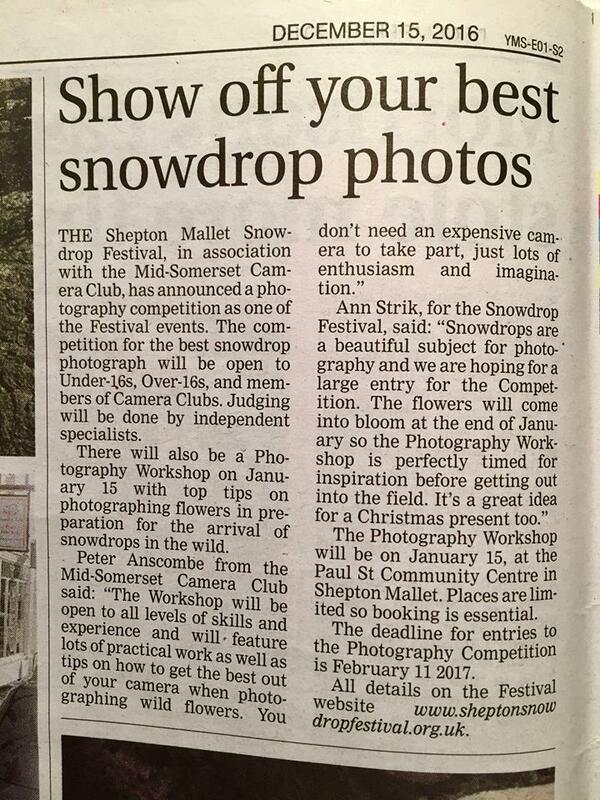 A community festival for the town of Shepton Mallet celebrating the life and work of James Allen. 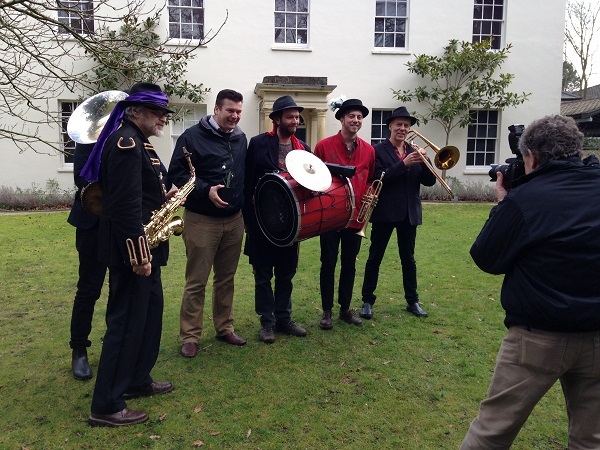 This year’s festival attracted visitors from far afield due to coverage on BBC Points West and BBC Radio Somerset. Michael Eavis opened the festival along with live music from the Drystones. 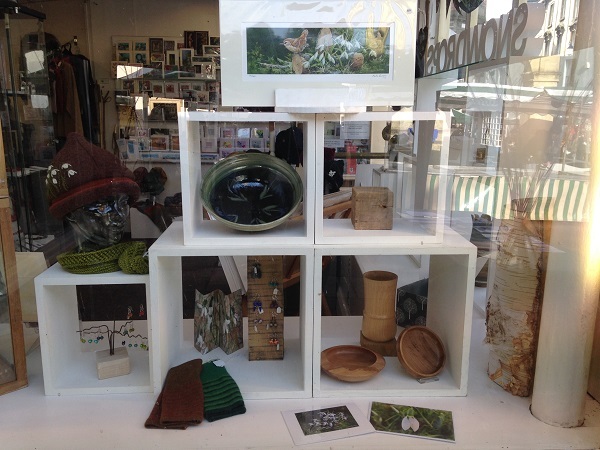 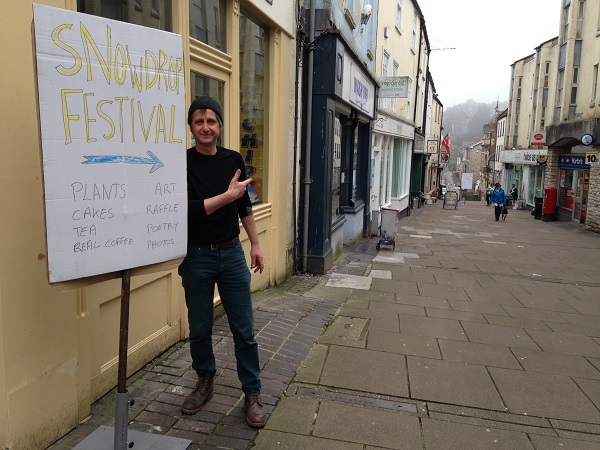 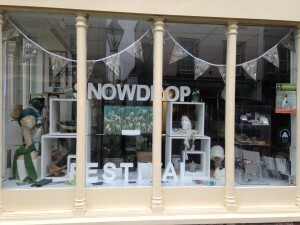 We had our wandering street poet, children’s fancy dress, specialist snowdrop stalls, arts & crafts, coffee & cake, children’s workshops, street trails, celebratory walk with band, poetry & photography prize giving to mention just a few things. 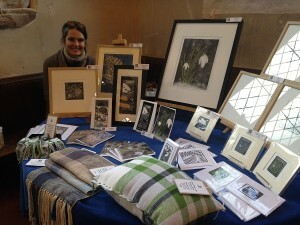 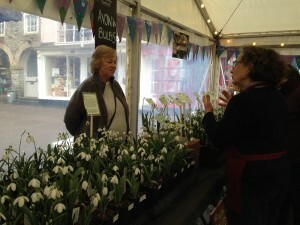 On Sunday Naomi Slade, author of The Plant Lover’s Guide to Snowdrops, gave a talk about snowdrops along with book signing. 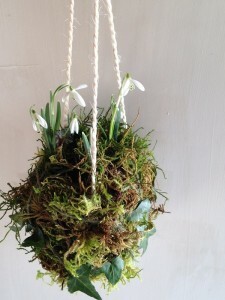 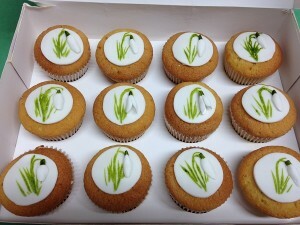 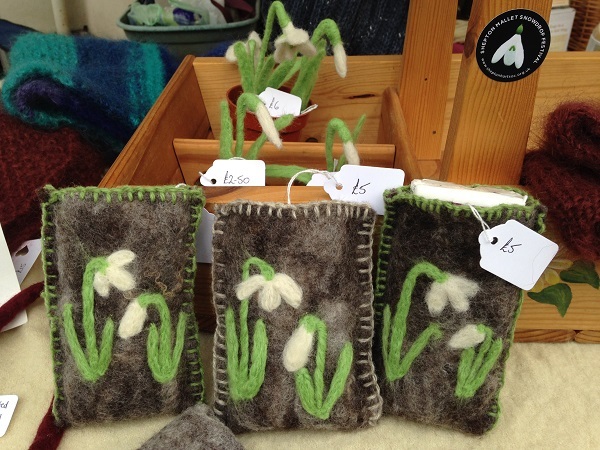 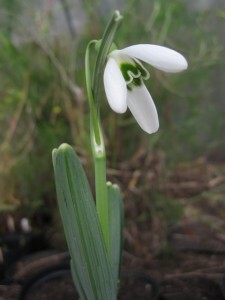 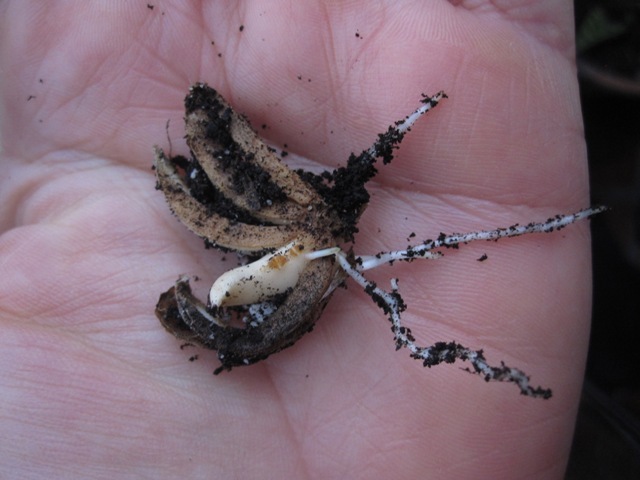 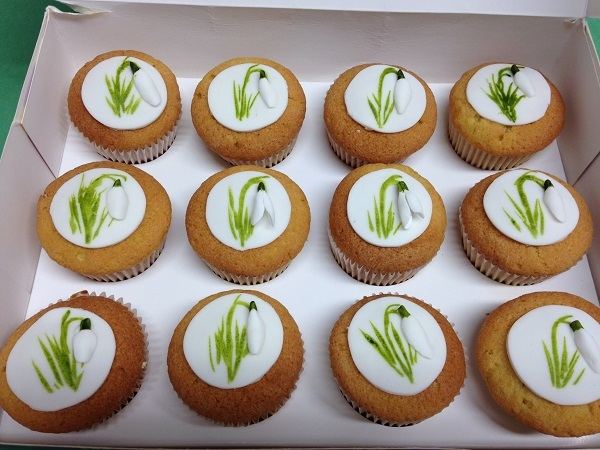 For tips on snowdrop growing from Naomi Slade, see our news page. 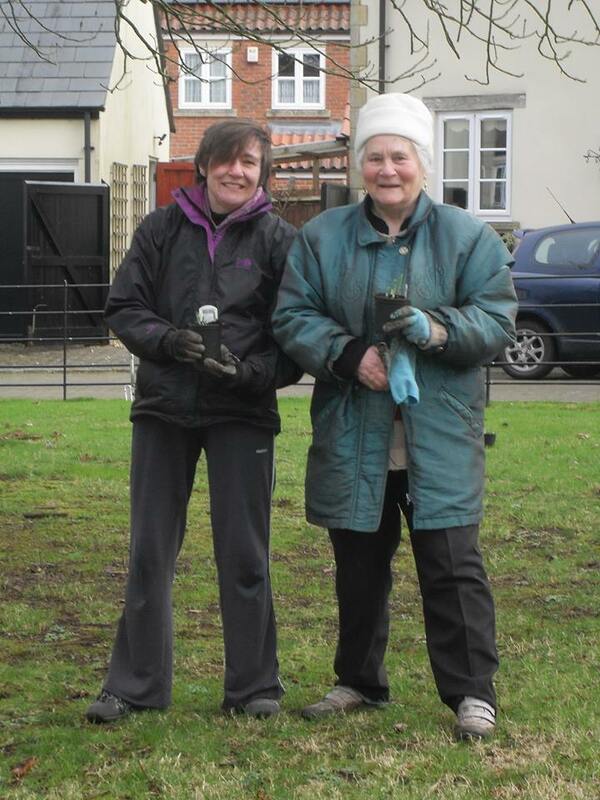 One of our members, with the help of her sister, took it upon themselves to plan 300 snowdrops on one of Shepton Mallet’s grassy verges. Fabulous that so many in the community are working towards this common goal. 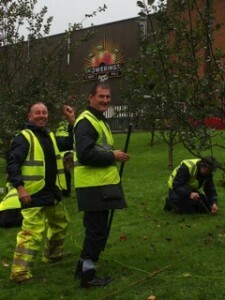 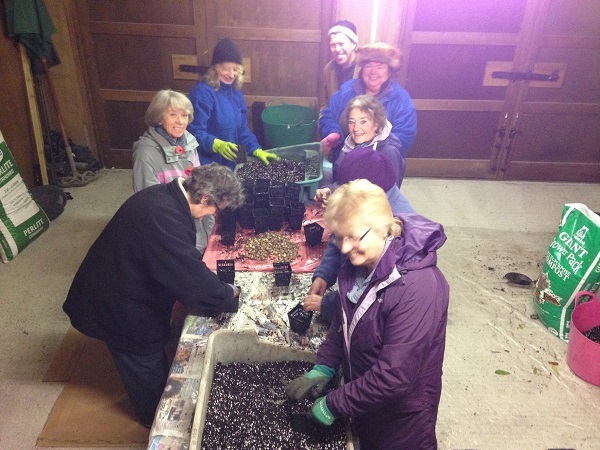 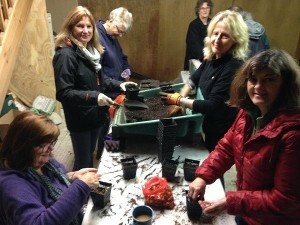 On Saturday, volunteers planted the orchard at Showering’s Cider Mill with 10,000 bulbs. 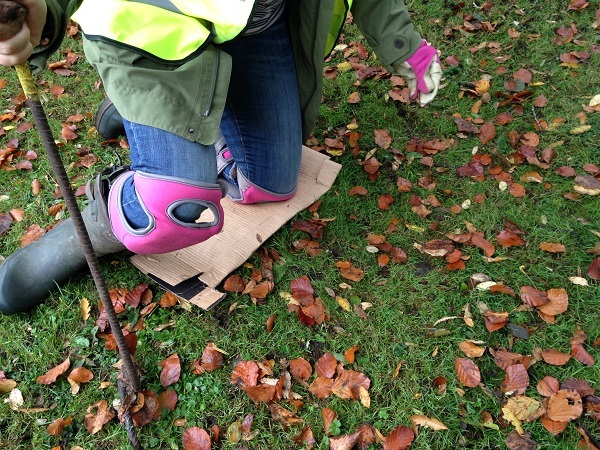 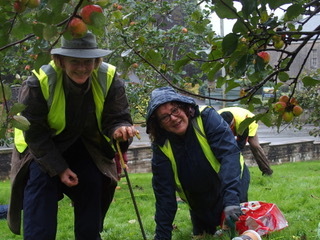 The 1st Shepton Mallet Beaver Group lent a hand despite the drizzle. We are grateful to Brothers Drinks for sponsoring this. 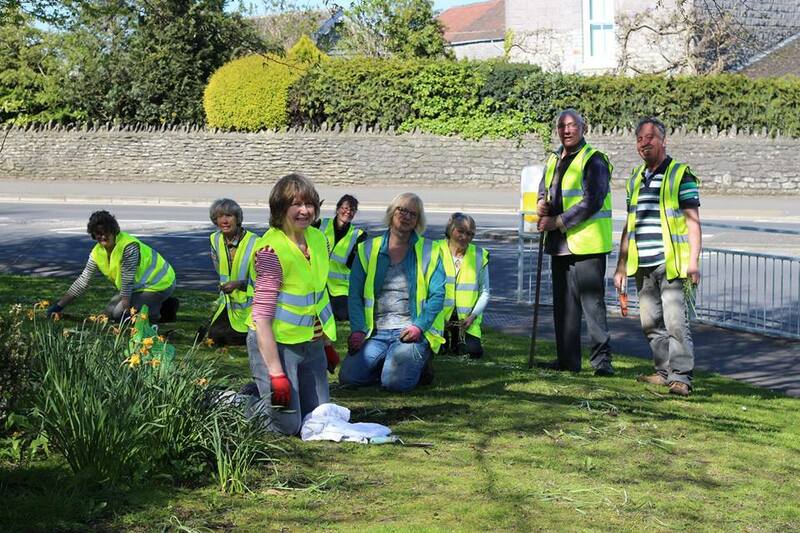 Wednesday 4th October 2017 100,000 Galanthus nivalis being planted in Shepton Mallet. This second mass planting has been made possible through our successful bid for a Section 106 grant from Mendip District Council and the planting is being done by Ideverde. 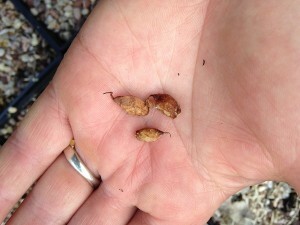 It is that time of year again, time to ‘chip’ or ‘twin scale’ Galanthus ‘Magnet’ bulbs whilst they are dormant. Phillipa and I cut up approximately 20 bulbs creating about 400 chips, these are now in a sealed plastic bag filled with slightly moist compost/vermiculite mix stored at 20 oC for 12 weeks. 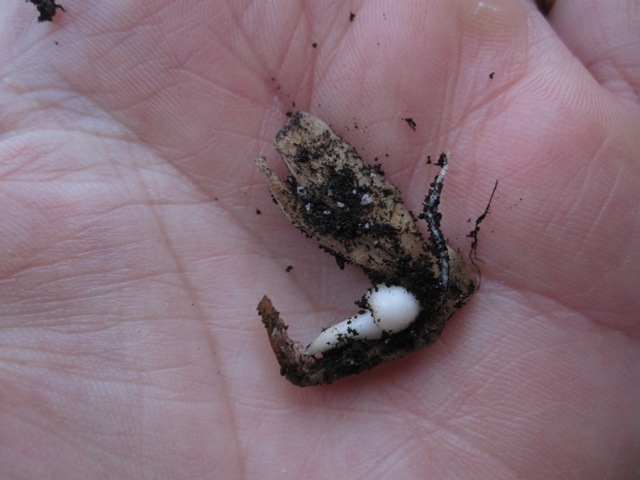 The big fat green snowdrop seed pods have quickly ripened to paper-thin brown shells which easily burst open revealing 3-6 fresh seeds some of which seem to be germinating. 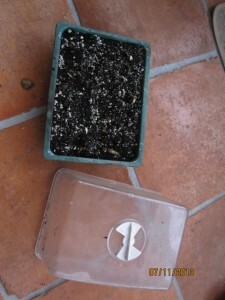 Pot up seeds, keep moist but do not over water. It will take 3-4 years to achieve a flowering plant. 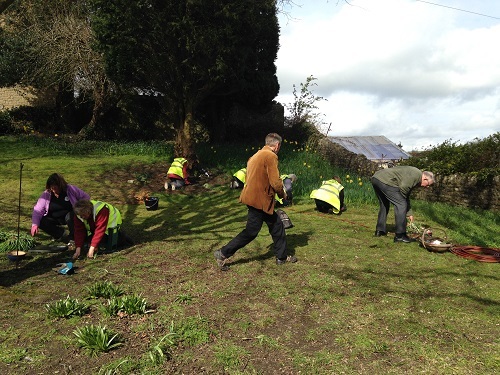 Saturday 8th April saw two teams from Shepton Mallet Horticultural Society head out into the town centre to plant 1000′s of snowdrops ‘in the green’. 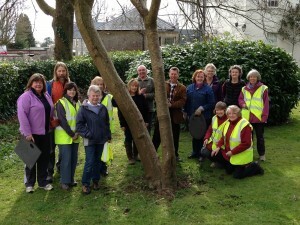 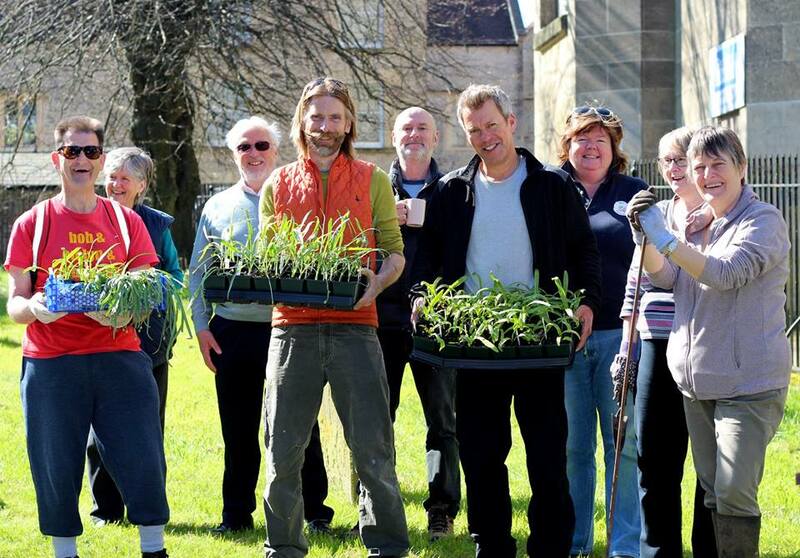 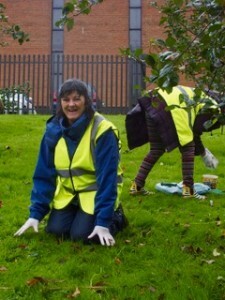 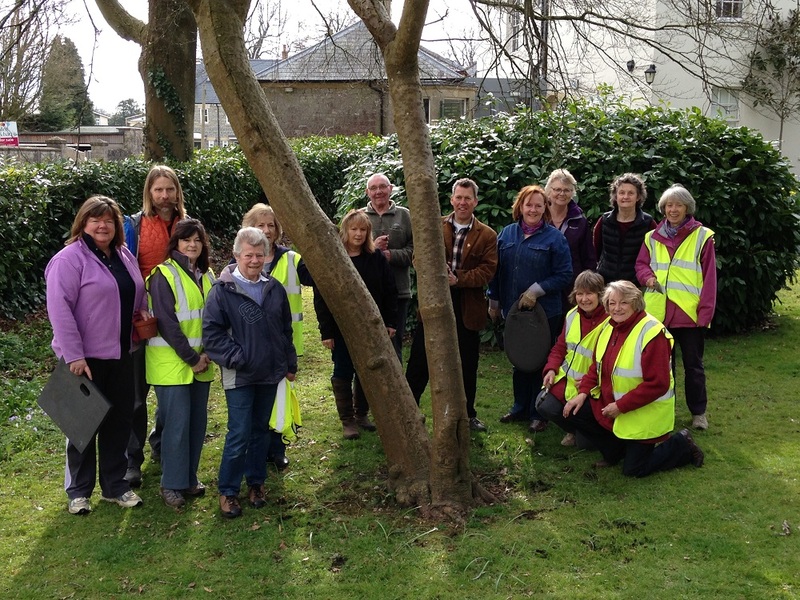 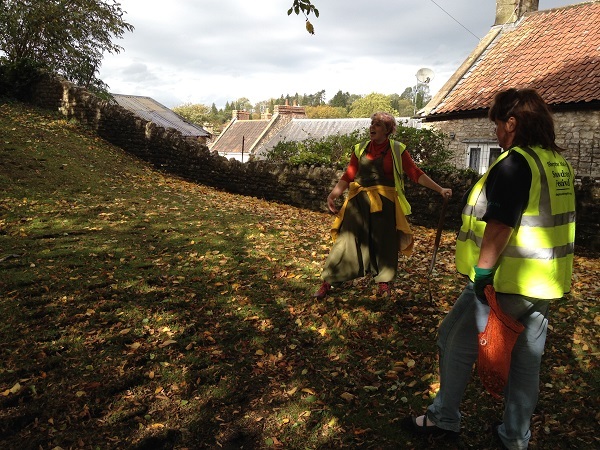 The church yard team were joined by the church volunteers as part of their annual ‘spring cleaning’ day. 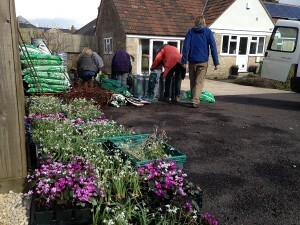 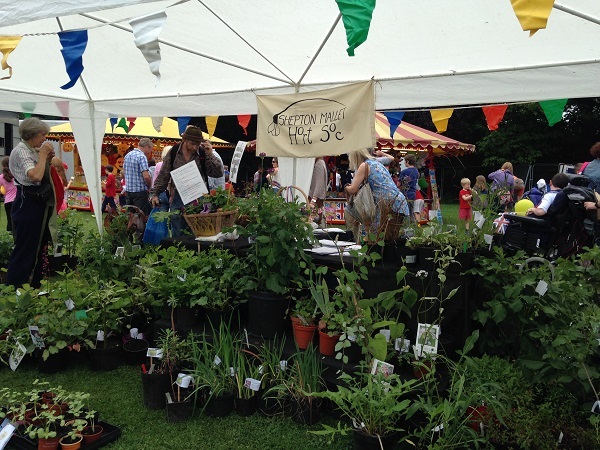 A range of different varieties were planted whilst the common bulbs were donated by local residents and supporters of the festival. 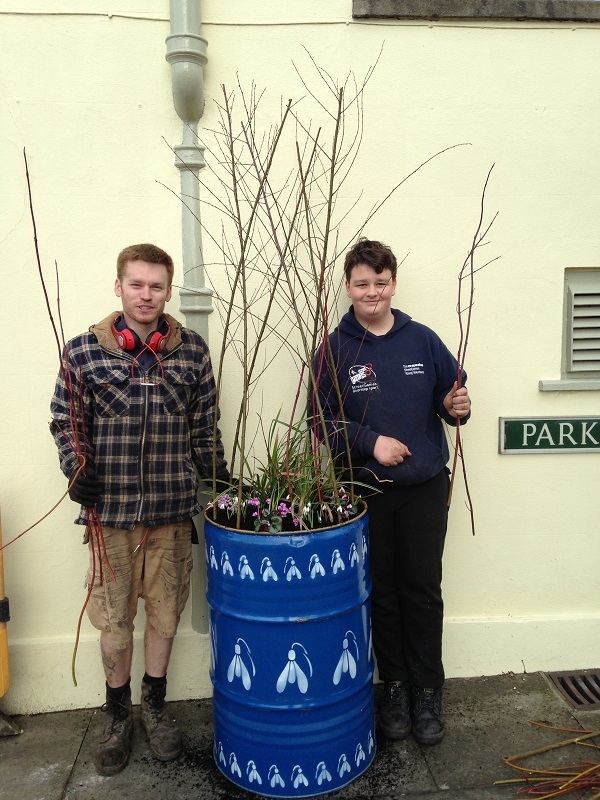 Taking in the planters, great team work by our members and – so many of the public came up to us to express their delight in the planters and how they wish they could be out all year round, the comments made all the hard work worth while. 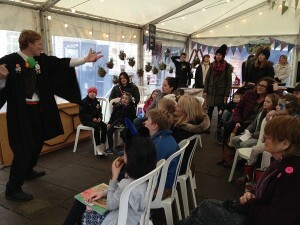 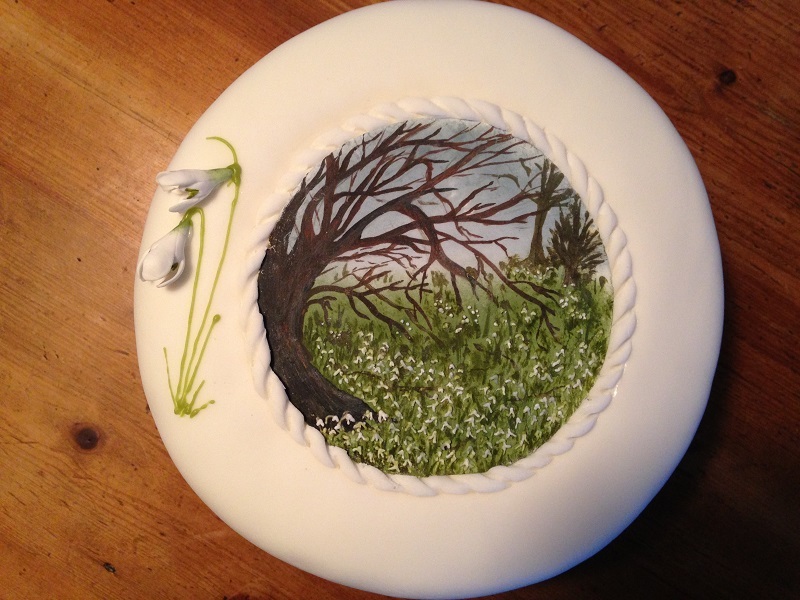 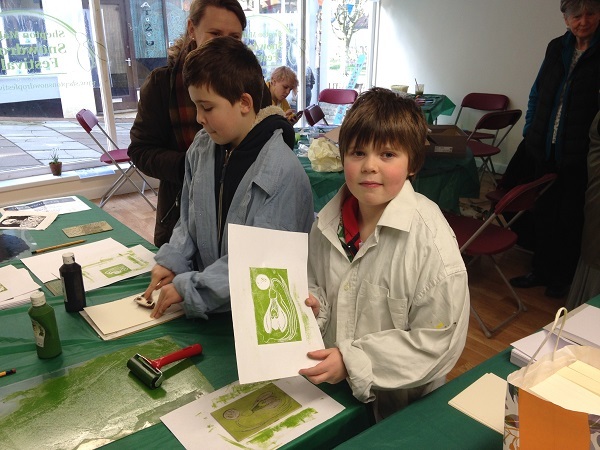 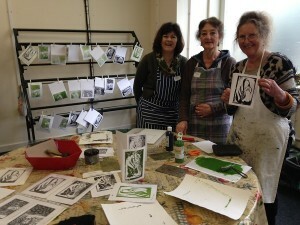 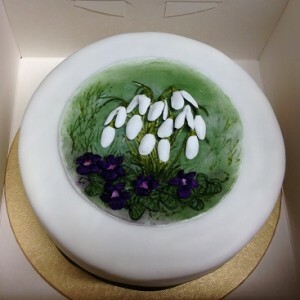 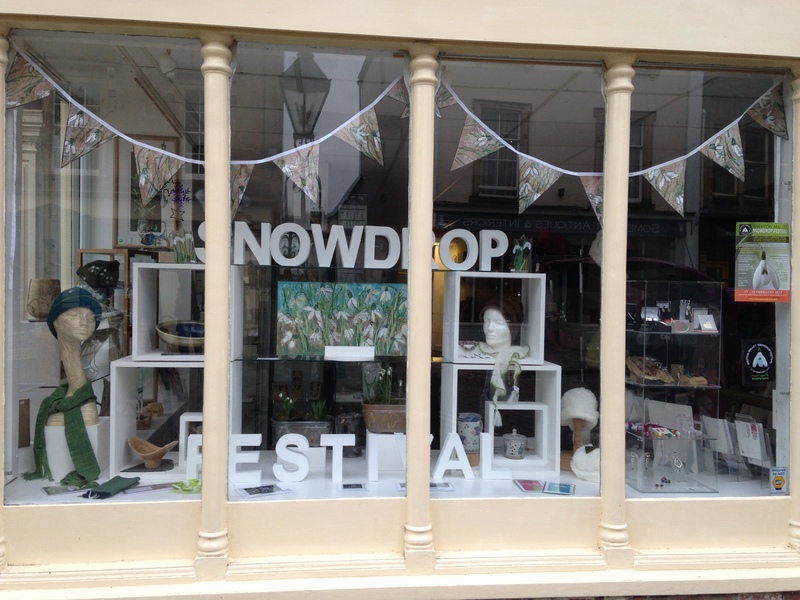 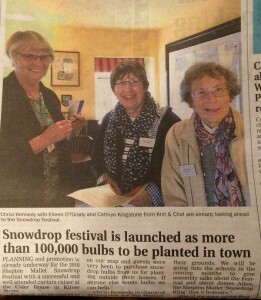 We have had a very exciting and successful first snowdrop festival celebrating the life and work of James Allen. We would like to thank everyone who has supported us in so ​many ways, with their time, goodwill & deep pockets. 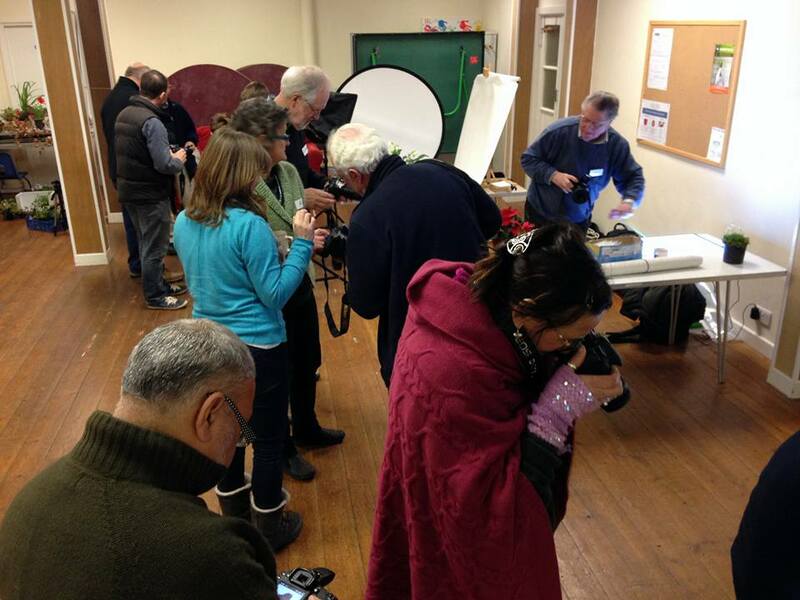 Here are some snap shots from the festival. Shepton Mallet Horticultural Society braved the fog to plant 10,000 snowdrop bulbs on the roundabout at Tesco’s Townsend store. 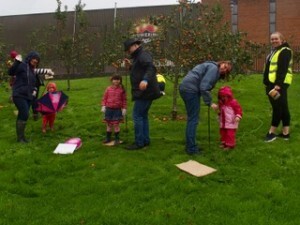 “We are so grateful to everyone who braved the weather to come and help with the planting, and to Tesco for their generous help and support (great coffee and cookies). The snowdrops will be the first flowers to bloom at the end of winter and in the years to come they will multiply to cover the ground. 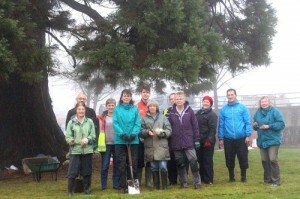 This will become a great community asset for the town”. Ann and Angela planted 1000 snowdrops on the roundabout at Whitstone school this morning. 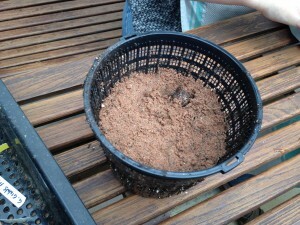 Despite the slightly damp weather and drips from the cedar tree, the soil was surprisingly dry. They lifted turves of grass with a spade, placed the bulbs beneath then flipped back each turf, it will be interesting to see how the bulbs grow. 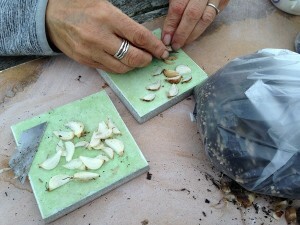 Sheets of plastic were used when lifting the turves so as to make it a clean and tidy job. 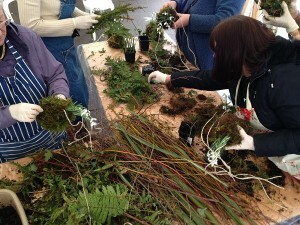 Potting the last 5000 snowdrops for the High Street display next February. We held an Awareness Day at Tesco in Shepton Mallet to explain our Snowdrop project to the public and we sold 100′s of Snowdrop bulbs (Galanthus nivalis) as part of the drive to plant snowdrops all over the town. 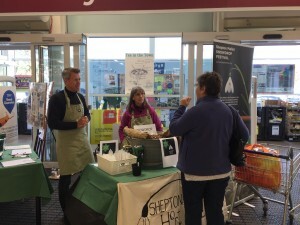 It was a great day, we felt we were able to raise awareness of the project before the Bags of Help vote and it was great to see how interested people were. We are very grateful to Tesco for their support. 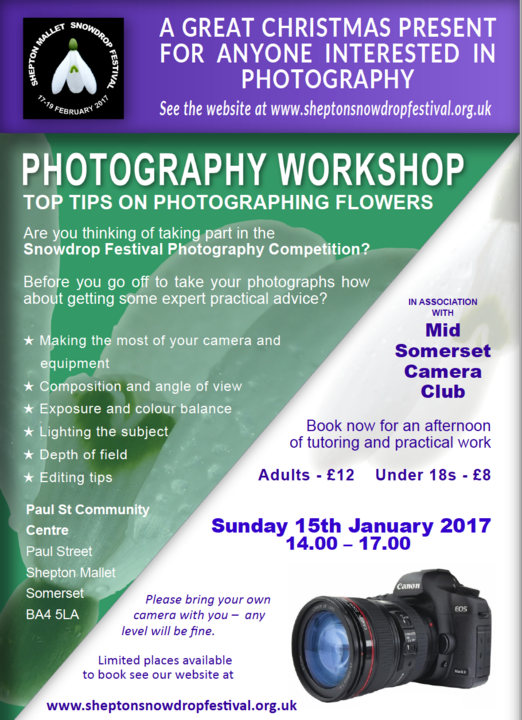 The Shepton Snowdrops will be a real asset to the town and as they multiply each year they will become a huge attraction in February. 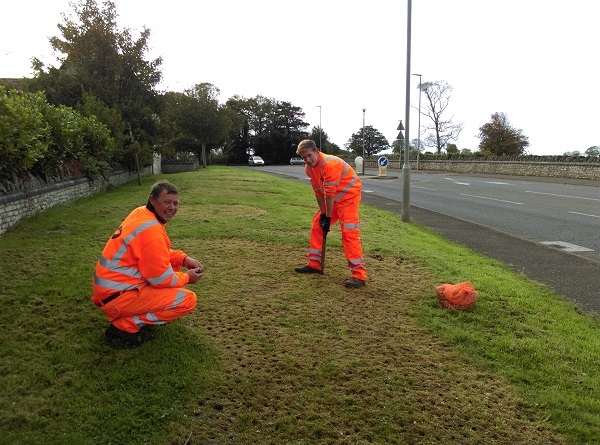 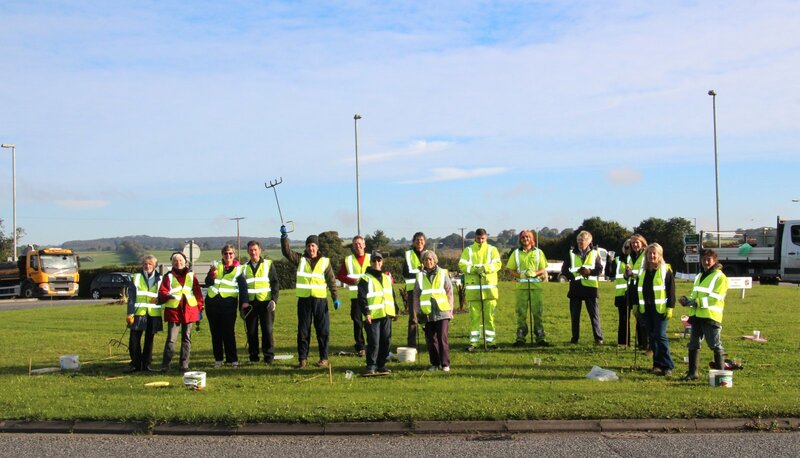 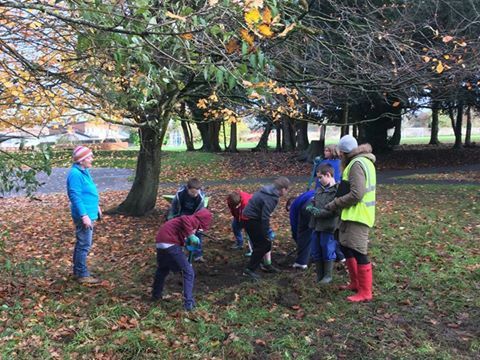 First mass snowdrop planting took place on the Rock Flock (Sheep) Roundabout with about 30,000 snowdrop bulbs and plans to plant another 30,000 around the town this autumn. 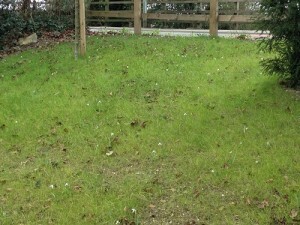 All these plantings are of Galanthus nivalis. 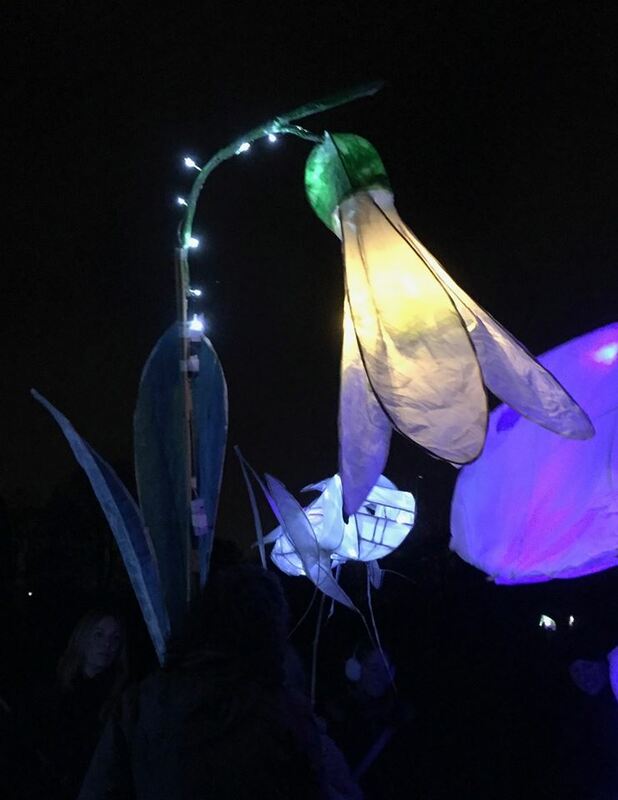 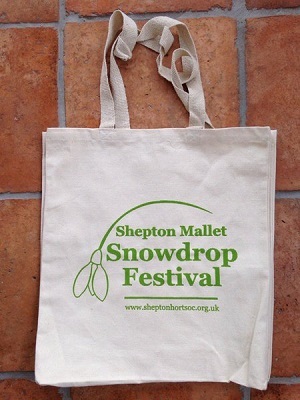 Shepton Mallet Horticultural Society are delighted to have secured funding from Tesco’s Bags of Help initiative for the Shepton Mallet Snowdrop Project. 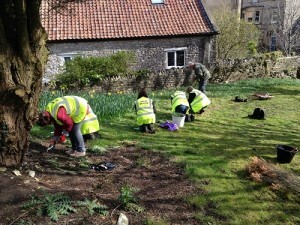 Tesco has teamed up with Groundwork on its Bags of Help initiative in hundreds of regions across England and Wales. 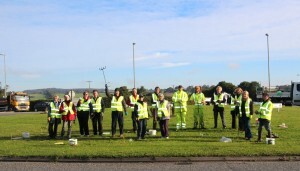 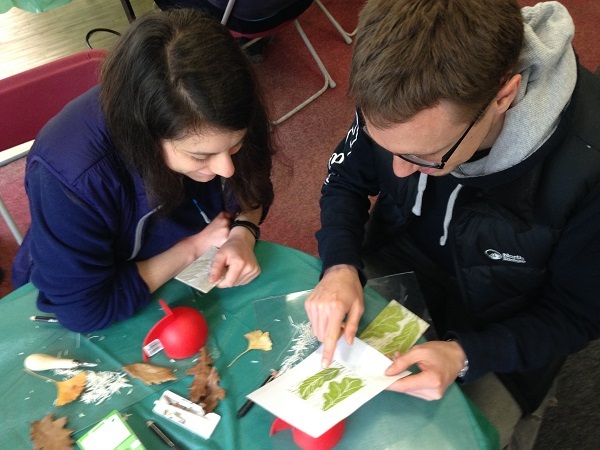 Bags of Help offers community groups and projects in each of Tesco’s 416 regions across the UK a share of revenue generated from the 5p charge levied on single-use carrier bags. 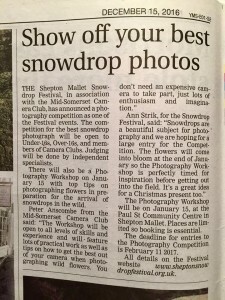 The public will now vote in store from 26 September to 9 October on who should receive the £12,000, £10,000 and £8,000 awards. 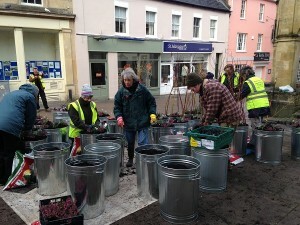 In total, there is over £12.5 million up for grabs. 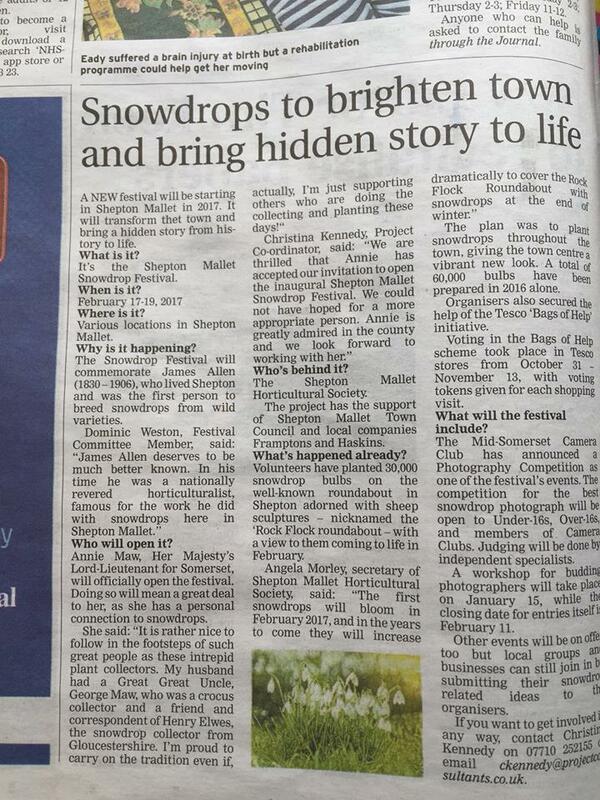 “We are extremely excited about our nomination for this award and very grateful to Tesco for this generous initiative. This funding will allow us to get off to a flying start with the Snowdrop Project which will be a community asset for years to come. By early February, the first snowdrops will emerge and we will be well underway. 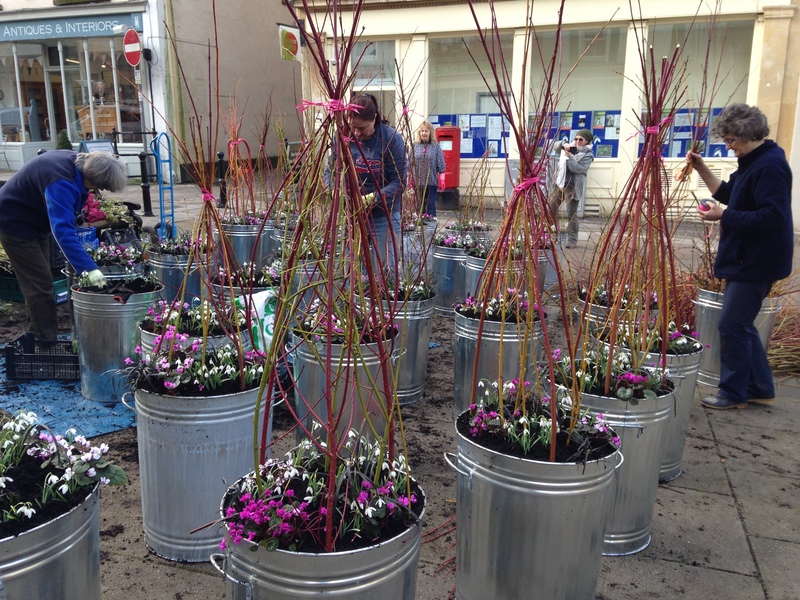 We look forward to a great display to honour the memory of Shepton resident James Allen”. 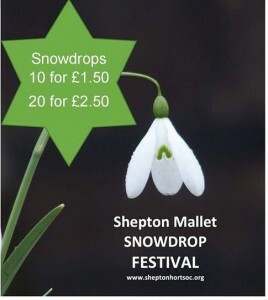 Please visit us our stand on Saturday 22nd October 10am – 4pm at Tesco (Shepton Mallet) to learn more, to purchase snowdrop bulbs and to get involved. 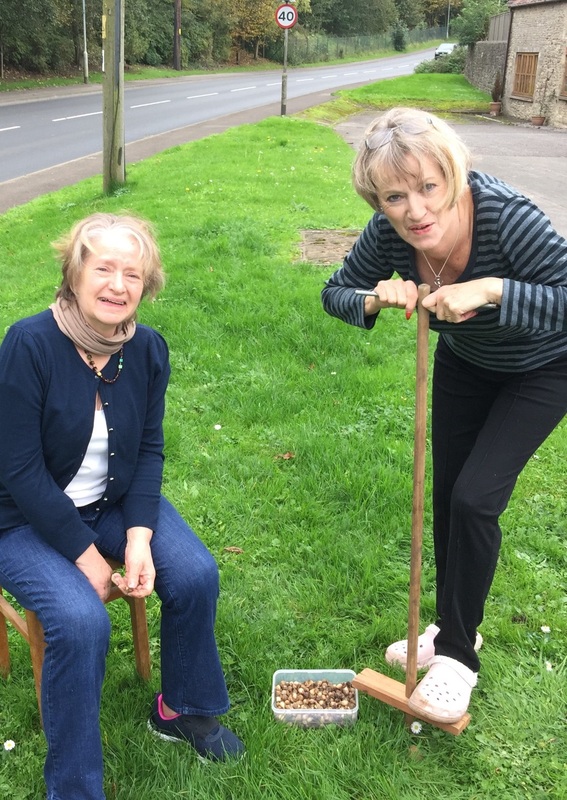 Two of our members, Chrisi and Angela, visited the Shaftesbury Snowdrop Group on Saturday to help with their ‘Its a Knock Out’ event. 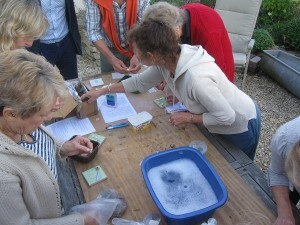 This involved the un-potting of Shaftesbury’s National Collection snowdrops, counting them and counting any offsets that may have grown, then potting up the parent bulbs and the offsets separately. Detailed records are kept : name, quantity, health, offsets, donor, location. A label is immersed in amongst the bulbs as well as a stick in label put in the top of the pot for easy reference (i.e. double labelling). Knocking out - The Aquatic pots that the snowdrops are grown in were immersed in plain black pots for display purposes only for the snowdrop festival in February. Pots are carefully emptied and sorted through in a container, parent bulbs are kept separate from off sets (bulbils that easily separate from the parent bulb). 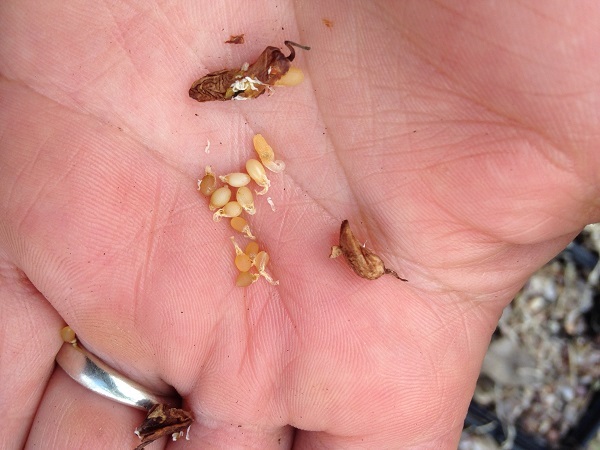 Vigilance for pest and disease is very important and any bulbs that are slightly discoloured (e.g. 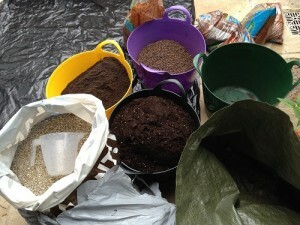 yellow, rot…) or soft, any doubts and the batch is put in isolation and pots are disinfected. 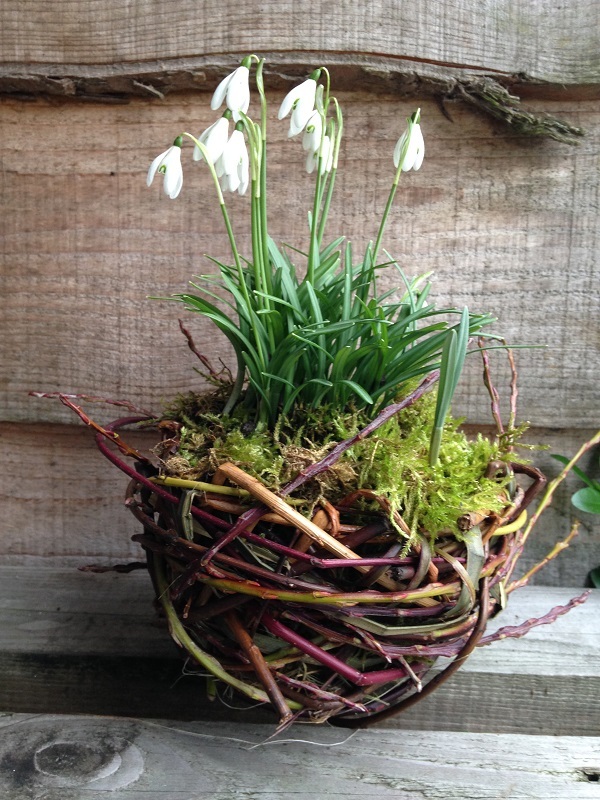 Bulbs are potted up quite close to each other as long as they are not touching (this saves space, pots & compost but also creates a better display when in flower). Spent compost is disposed of in a dedicated site just in case any bulbils escaped notice and they will then be able to grow on happily in a mixed planting. 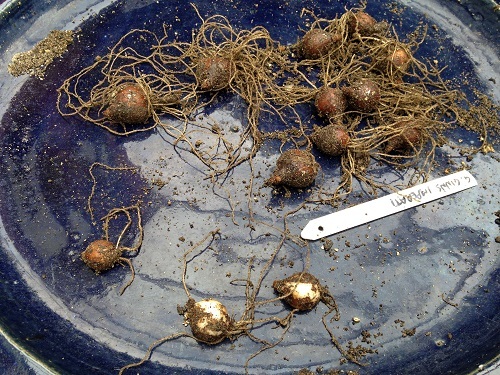 There was a lot of root growth on some of the bulbs suggesting they are coming out of dormancy, ‘knocking out’ could take place in July to make the potting easier. 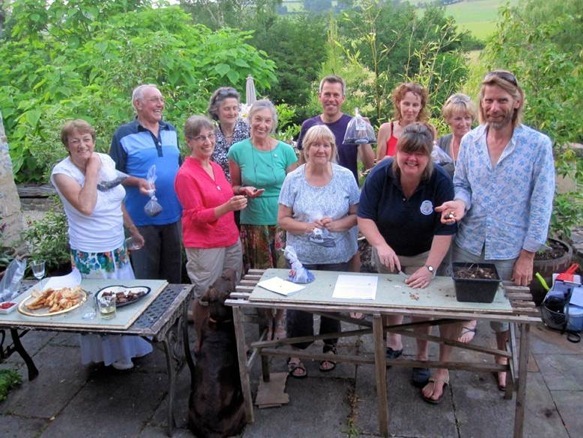 The mix - there is no one mix recommended, everyone suggests something different but this is what the Shaftesbury group use and they find it works well for them. Our fourth propagation event, we used the chipping method on smaller bulbs and a mix of chipping and twin scaling on larger bulbs. 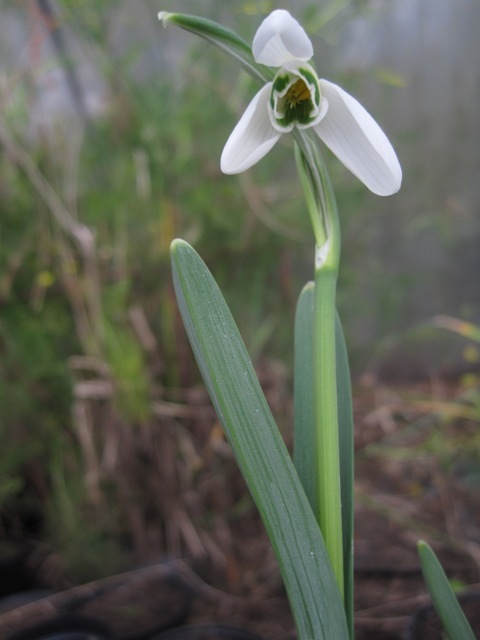 This year we only managed to source Galanthus ‘Magnet’ although we had hoped to start propagating the other of John Allen’s varieties Galanthusi ‘Merlin’. 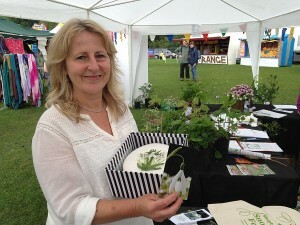 Lucy, one of our members, won the raffle! 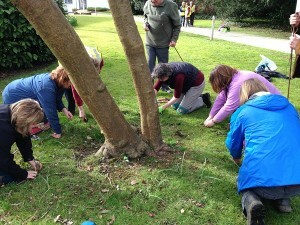 Today marked the first phase of planting snowdrops in Shepton Mallet. 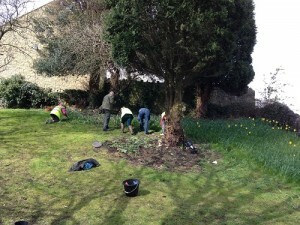 We planted our three year old own propagated Galanthus ‘Magnet’ around a tree outside of Highfield House where Jame’s Allen used to live. It was a very special moment planting out these young plants that each of us had been nurturing over the past 3 years. After planting our special bulbs we walked to Rectory Road where we planted approximately 4000 common snowdrops which were donated by members of our group and dug up from our gardens (special thanks to Irene Minty who supplied us with a massive tray of plants). Our thanks go out to two members of the public, Peter Hillman and Eleanor Norman, also donated plants. 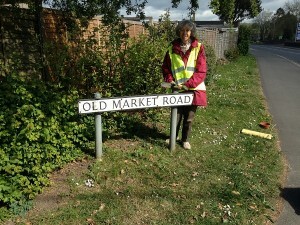 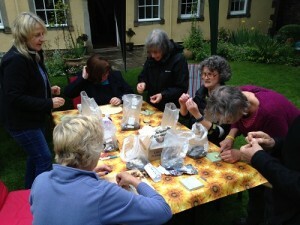 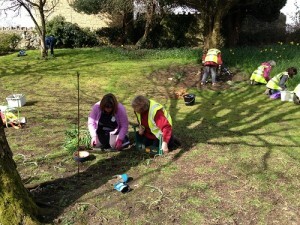 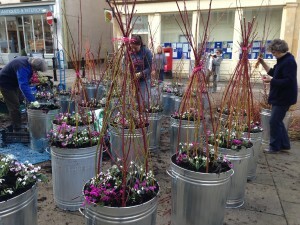 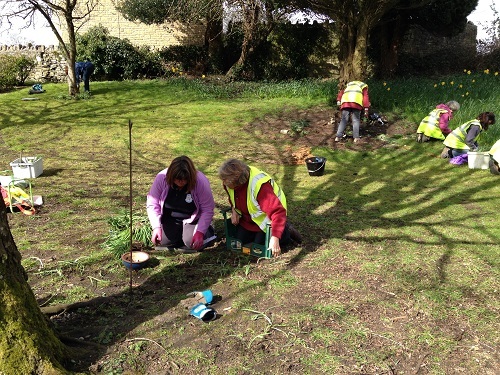 We also thank Sue Church from Mendip District Council who joined the planting party and gave support to the project. 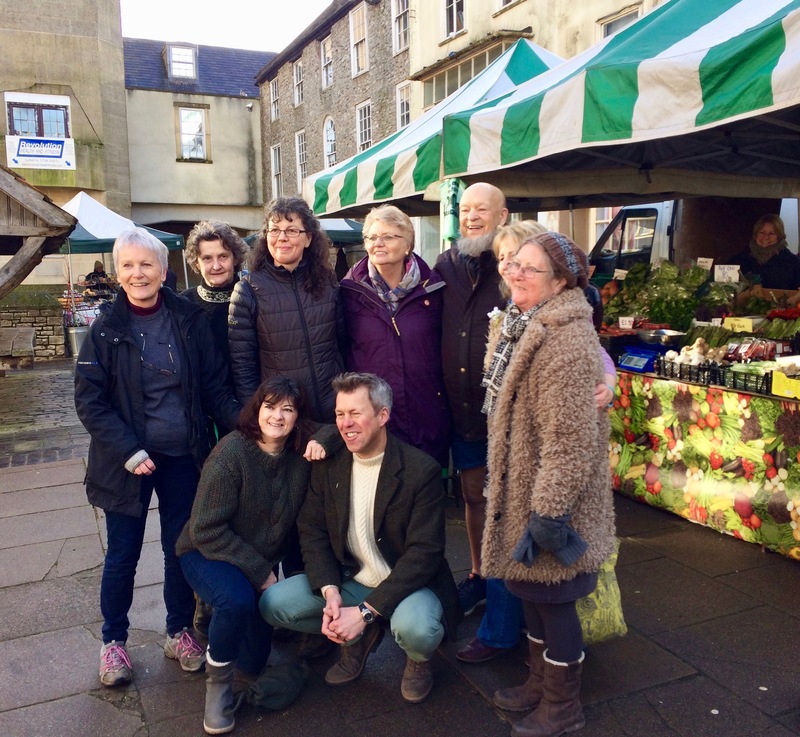 Dredge and Male, our local hardware store, saw our activity and pledged to support the project in the future for which we are very grateful. 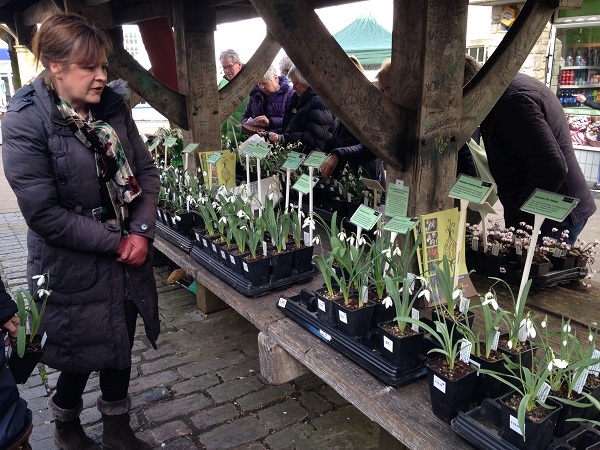 Two of our members, Simon and Wendy, both have flowers on the bulbs that were propagated by chipping in 2013 – very exciting! 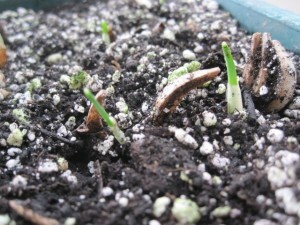 Hopefully everyone else’s bulbs will flower next spring. Bulbs are supposed to be fully dormant when chipping or twin scaling, I noticed that the flower bud had started to grow and therefore the bulbs were not fully dormant. I did not attend last year’s propagation session so did not spot this. 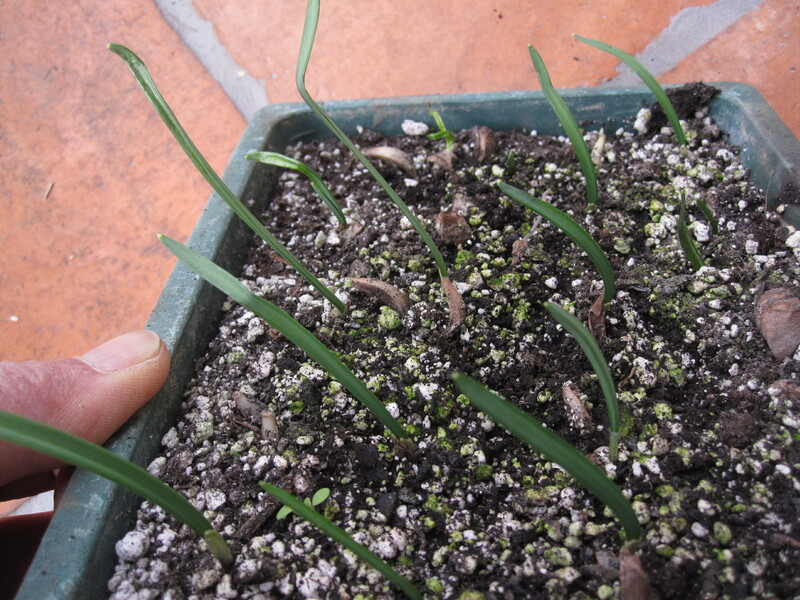 I think propagating in late July is too late. 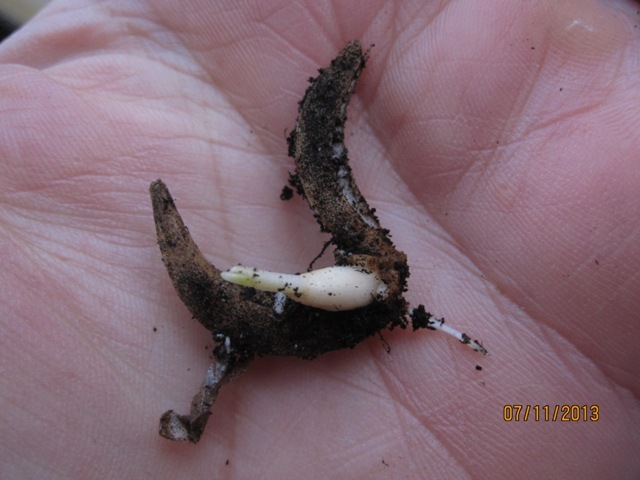 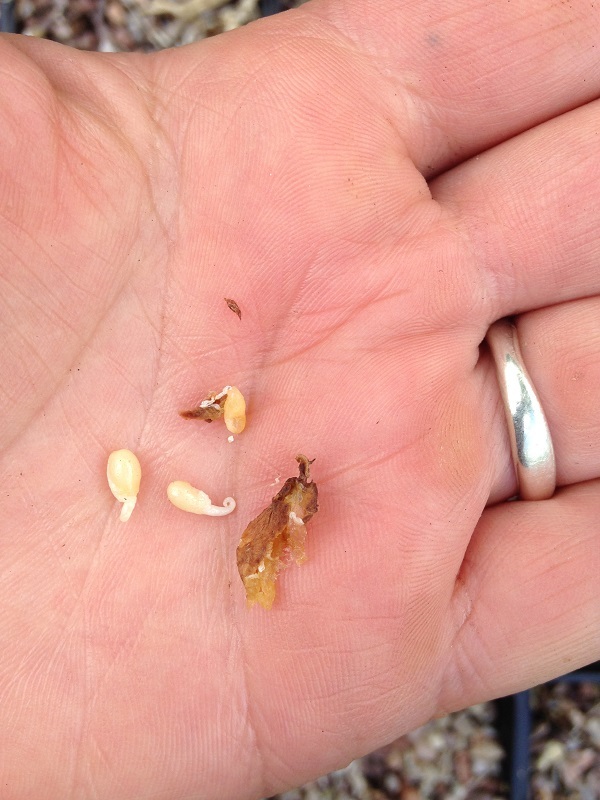 Many of our members report failure from last year’s propagation. In 2016 we should set a date for late June. 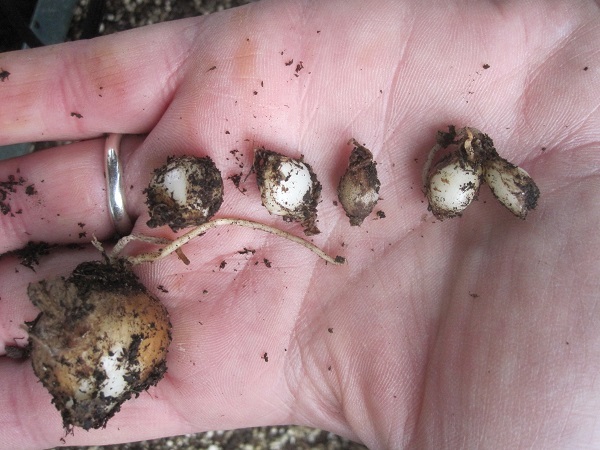 Chipping appears to raise more new plants than twin scaling when using snowdrop bulbs or at least it is easier to cut chips with a piece of basal plate. 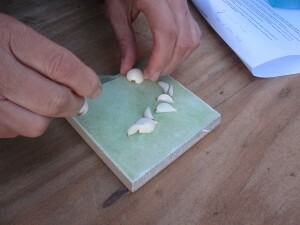 We found that we were only getting about 8 twin scales from a bulb compared to about 10-12 chips using the chipping method. In 2016 we will probably go back to chipping rather than twin scaling. 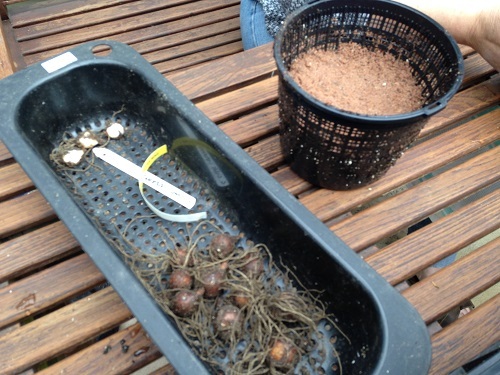 The large bulb on the left is at least 5 or 6 years old whilst the small bulbs are from our 2013 propagation workshop – raised in a seed tray outdoors. 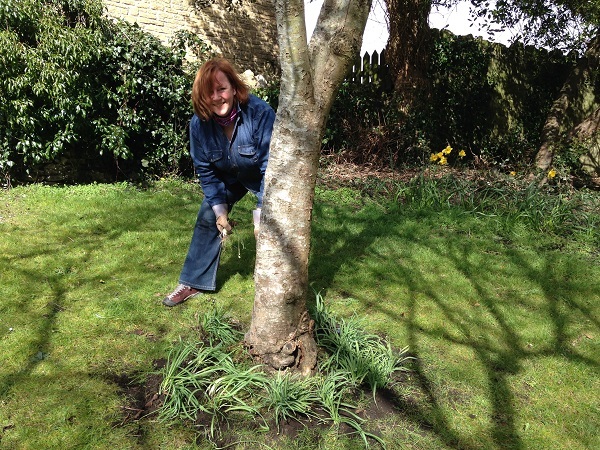 Jennifer Harmer has compiled a database of gardeners who in their day were galanthophiles. 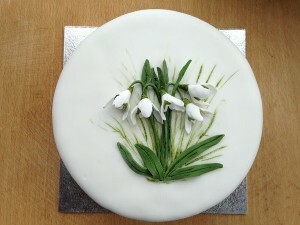 In the 19th century there was a huge mania for snowdrops just as there is today. She is co writing a book on the stories of the galanthophiles with Jane Kilpatrick whose latest book, The Fathers of Botany, has recently been published by The Royal Botanic Garden Kew. 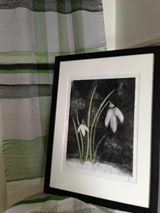 The snowdrop is not indigenous to the UK and no one is sure when or how it came here, there is some speculation that the Romans brought them but this is not proved. 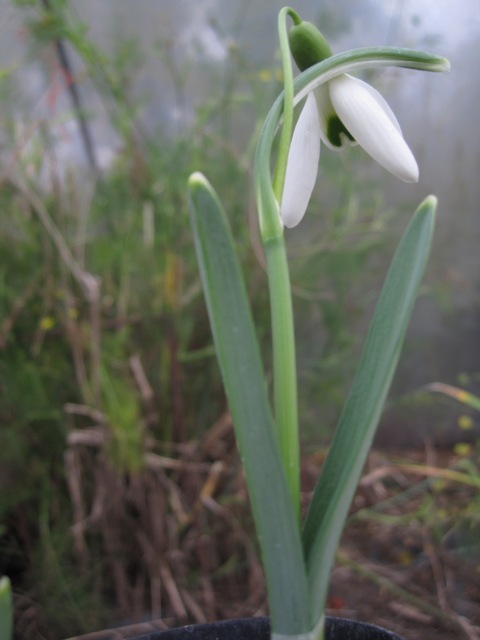 Galanthus plicatus being amongst the first new species to arrive in the early 19thcentury. The Galanthus nivalis, the common snowdrop which is often found naturalised in churchyards has religious significance due to it being white and flowering at Candlemas. 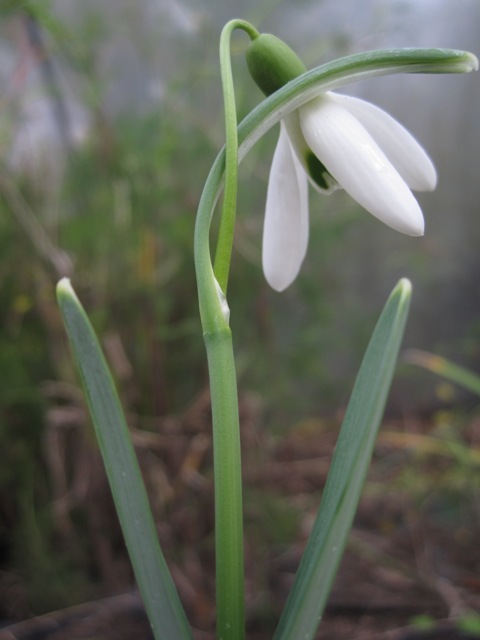 James Atkins (1804–1884) a nurseryman, who had a brief partnership with John Jeyes (a chemist who invented Jeyes Fluid), collected many plants but the snowdrop for which he is remembered for is Galanthus ‘Atkensii’. 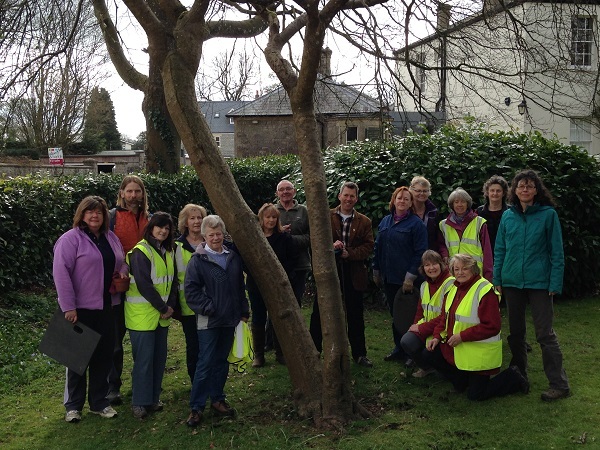 Peter Barr (1826-1909) was interested in species rather than the specialist cultivars and his G. ‘Atkinesii’ stock did not survive. George Wheeler (1791-1878), however, was the only commercial nurseryman to buy stock of G. ‘Atkensii’ from Barr and his plants thrived. Reverend Harpur Crewe (1828–1883) is considered to be the one of the earliest galanthophile writers. 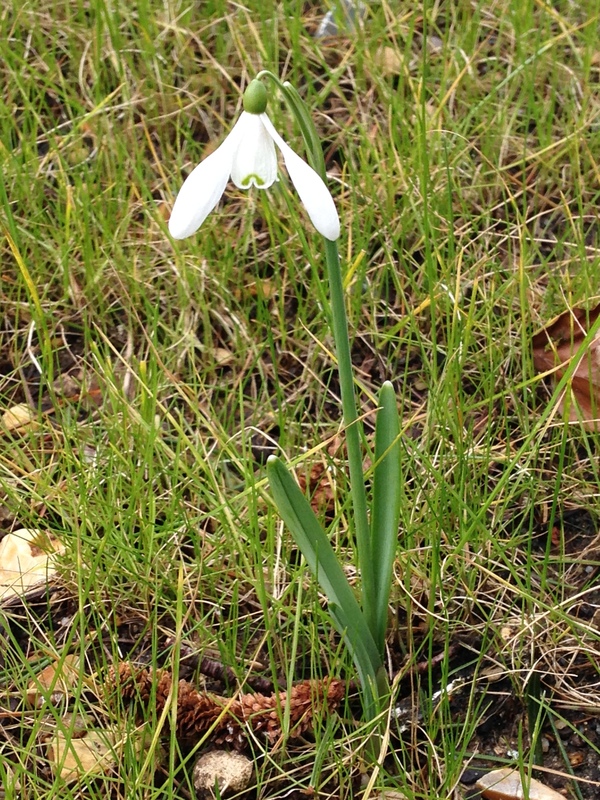 James Sanders found the first yellow snowdrop Galanthus nivalis Sandsersii Group growing in Northumberland. Last year one bulb of a yellow snowdrop fetched over £700. 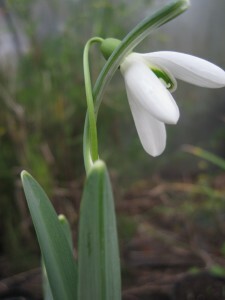 variety), Galanthus ‘Merlin’ and Galanthus ‘Galatea’ (similar to Magnet). 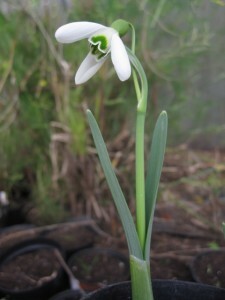 There is also a Galanthus ‘Allenii’. 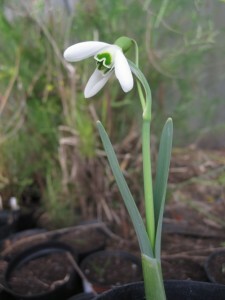 Henry Elwes (1845-1922) after whom Galanthus elwesii is named (easy to identify for its lovely wide leaf and glaucous foliage colour). John Gilbert Baker (1834 – 1920) was very important in his time working at Kew verifying new species of snowdrop. Frederick Burbidge (1847-1905) was a collector rather than a breeder of snowdrops but he had huge knowledge of their history and was one of the three who presented a paper at the 1891 Snowdrop conference. David Melville (1870–1924) introduced Galanthus nivalis ‘Melvileii’ which James Allen used as a seed parent in his breeding programmes. 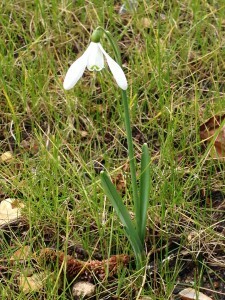 David was one of the three who presented a paper at the 1891 Snowdrop conference and therefore very influential. 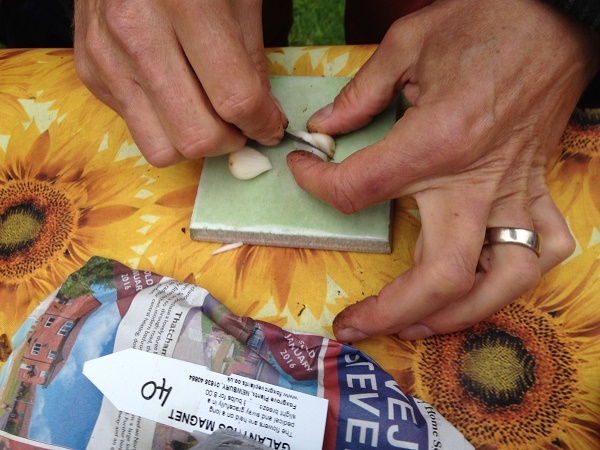 Maximilian Leichtlin (1831-1910) had a botanical garden in Baden Baden in Germany was a friend of James Allen swapping both information and bulbs. Theodoros Orphanides was a Greek poet and botanist who found and introduced Galanthus reginae olgae which flowers in the autumn. 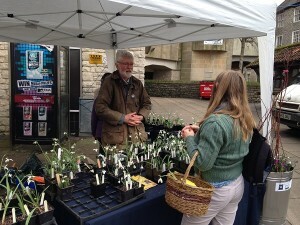 A E Bowles (1865–1954) renowned horticulturist and important in the world of snowdrops. He was friends with both the Victorian galanthophiles and later gardeners such as Amy Doncaster, therefore acting as a link between James Allen and the younger generation of galanthophiles. Amy Doncaster was a one of the best of the 20th century plantswomen and a link ensuring the survival of snowdrop into the mid 20th century. 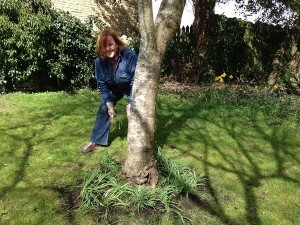 She created a large woodland garden in the Chandlers Ford and lived to over 100 years old. She is known for many snowdrops including Galanthus ‘Doncaster’s Double Charmer’ which she thought to be derived from one of James Allen’s although modern galanthophiles believe it is not the true Allen plant. Samuel Arnott (1852-1930) bred in the 1920′s Galanthus ‘S Arnott’, an excellent snowdrop with some scent (but no James Allen connection!). 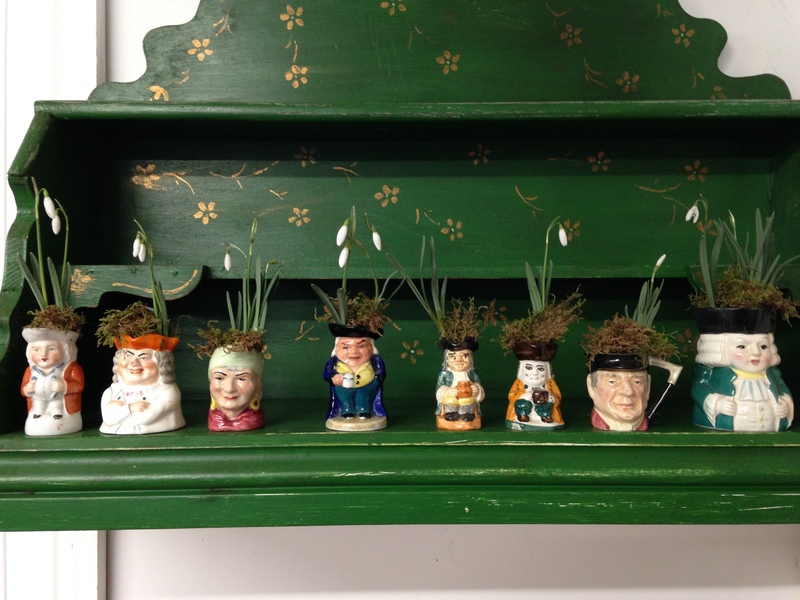 Winifrede Mathias and her galanthophile gardener (Herbert Ransom) were responsible for introducing snowdrops to a much wider range of people through their nursery The Giant Snowdrop Company during the 1950′sand 60′s. 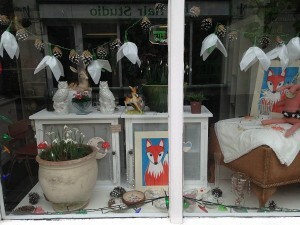 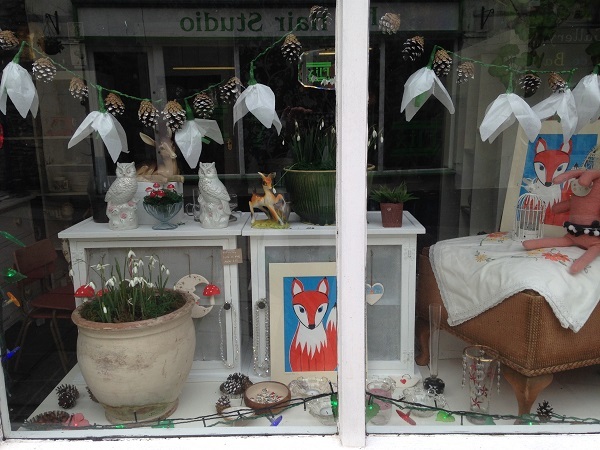 Up until then snowdrops had nearly always been swapped or given away amongst collectors. 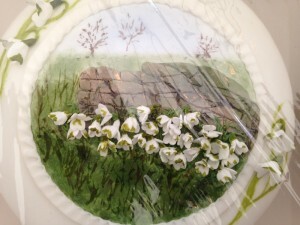 Ruby Baker – a great modern galanthophile historian who has recently died and will be a great loss to the snowdrop world. 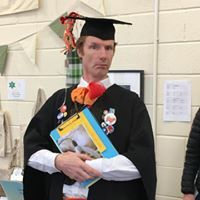 Born at Windsor Hill Mill (family milled corn for bread and animal feed) just outside Shepton Mallet where he lived until the 1850′s helping his mother and brother John run the mill. During the bread riots of 1842 the mill came under attack, but John, then aged 18 persuaded the rioters to leave on the written promise that if they returned in the morning they would give flour to those who came from of Shepton Mallet. After the death of their mother the 3 brothers, John, James and Joseph moved into Shepton Mallet. They purchased Old Mill in Park Road, John lived in Highfield House next door and James was opposite at Park House. 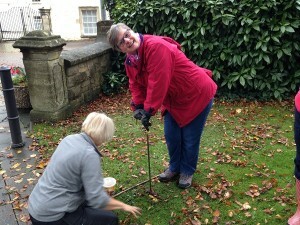 James moved into Highfield House in the 1890’s after John’s death. 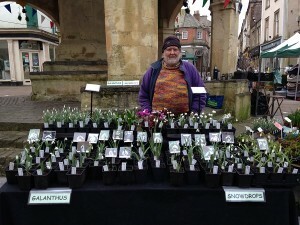 Botrytis eventually destroyed his snowdrop collection but in an effort to save his plants he sent some to Henry Ewbank (1828-1906) on the Isle of Wight however there is no evidence that the bulbs survived and therefore (the Botrytis probably went with the bulbs).He suffered ill health from the 1880′s, dying in 1906. He is burred justoutside the chapel at Shepton Mallet cemetery with his family. 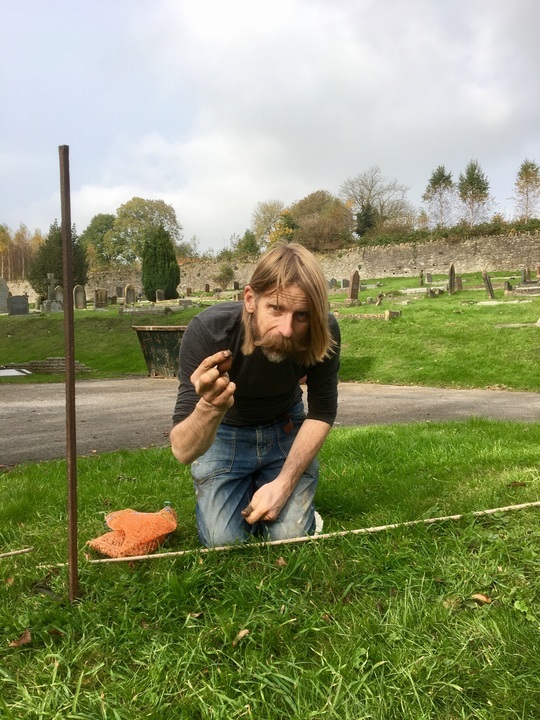 A tall ornate stone obelisk formed part of his grave stone however it was dismantled by Mendip Council in 2002 on the grounds that it was not safe. 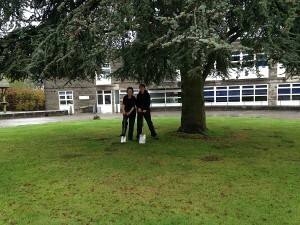 James Allen’s correspondence is held at the RHS. 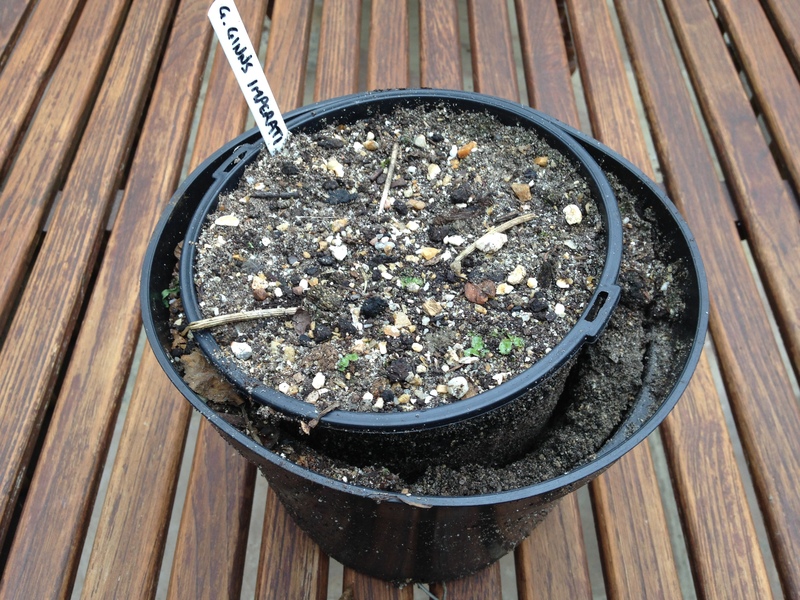 James Allen also bred Anemone nemorosa ‘Allenii’ (and there reports that blue anemones still grow at Highfield house however they need to be formally ifentified) and Chionoscilla allenii which is also commercially available. 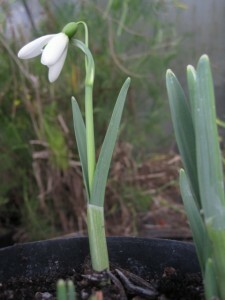 Our control snowdrop bulbs (potted and kept in a cold polytunnel) are flowering. There are 100′s of snowdrop species all looking much the same to the untrained eye. Here are some portrait photos of our Galanthus ‘Magnet’ for you to compare with snowdrops you might have growing in your garden. 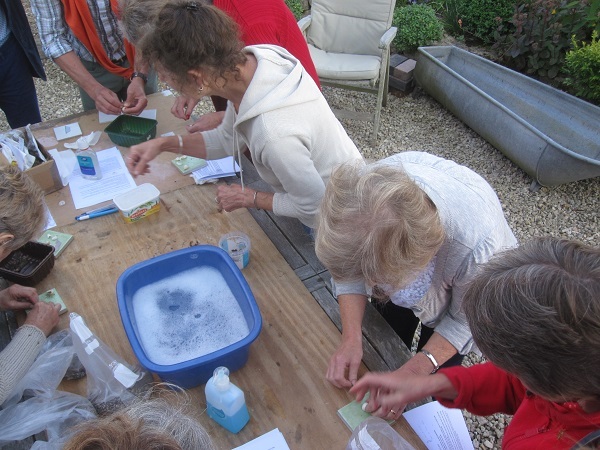 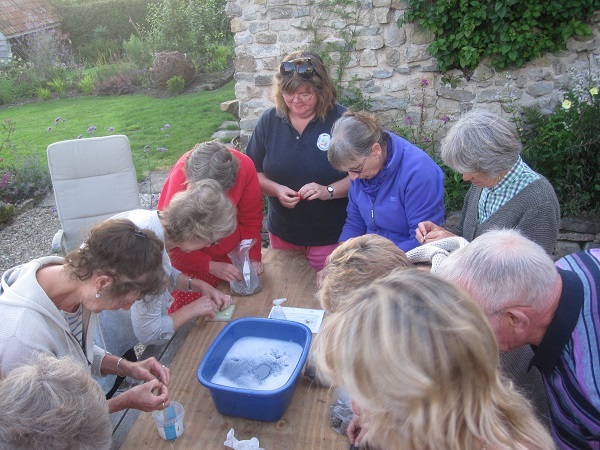 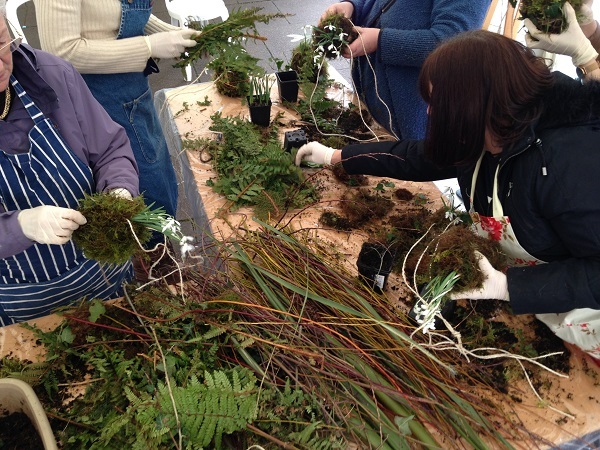 At our November meeting we all brought in our chipped snowdrop cuttings to compare bulbil and root growth. It is such an exciting project, we have already potentially propagated about 400 new plants from our chip cuttings in June. They will probably take 3 years before they flower, each year slowly becoming bigger and fatter bulbs. 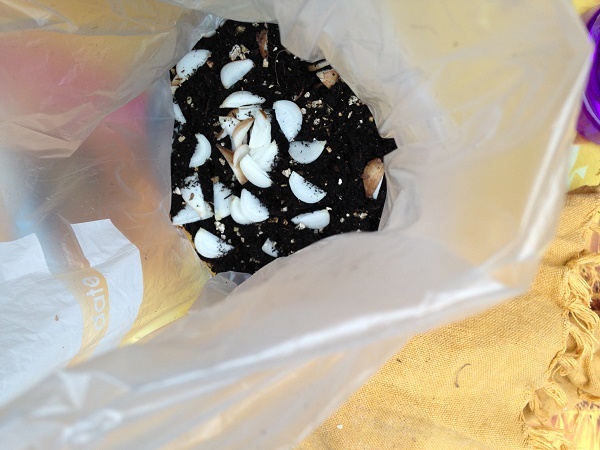 This is the method we have used (from the RHS web site), it also works well for daffodils, Hippeastrum, Allium, Fritillaria, Iris and hyacinths.